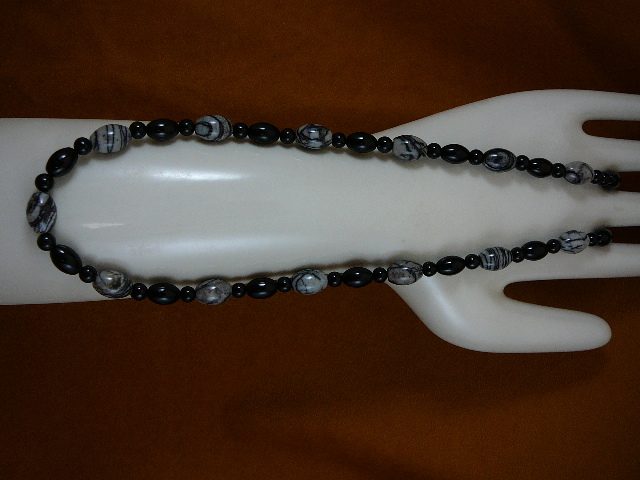 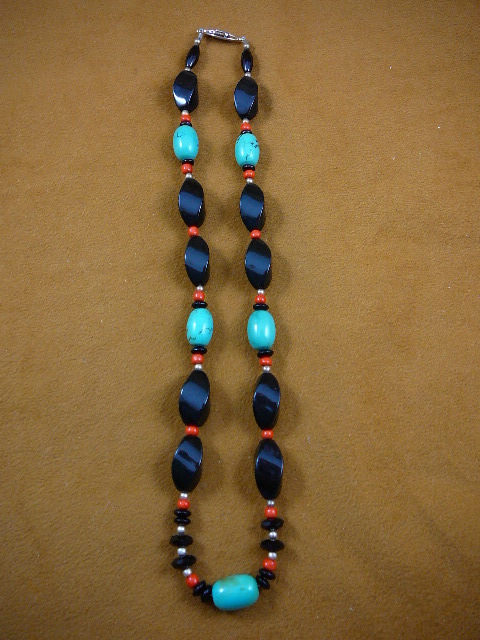 * Larger than 20", special order is $2.50 per inch. 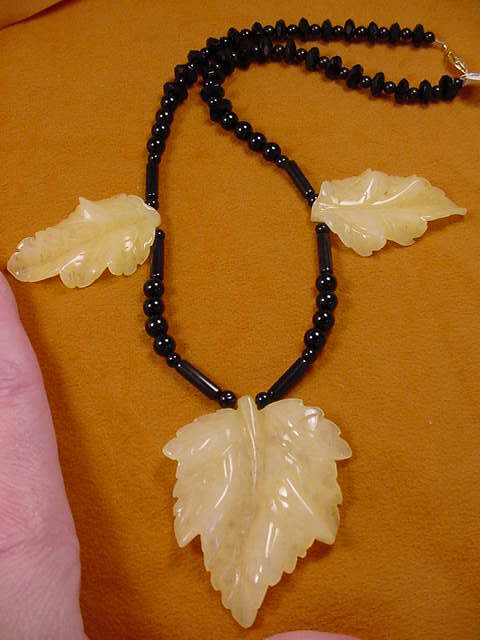 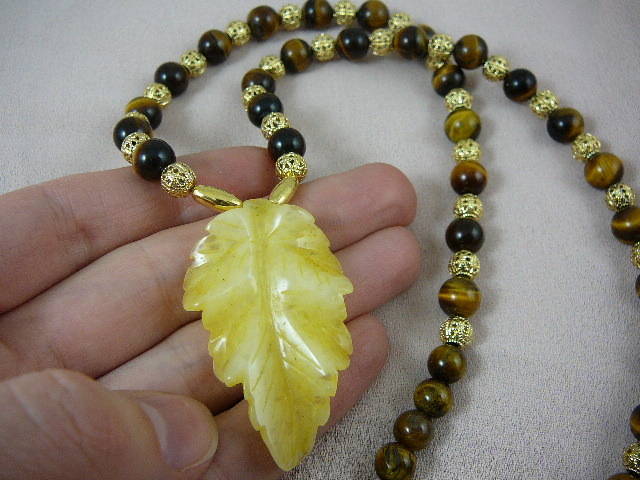 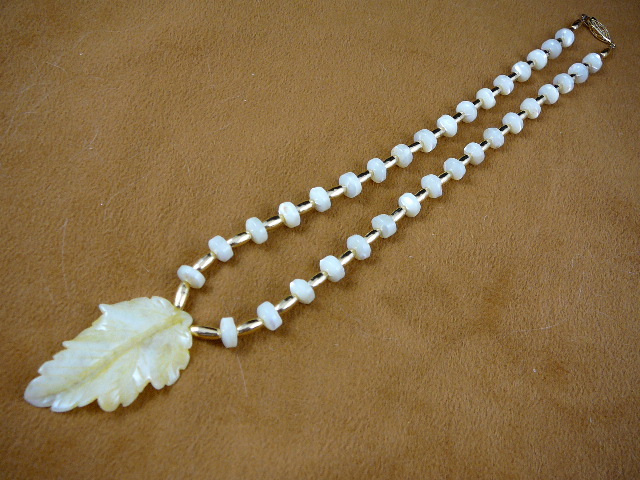 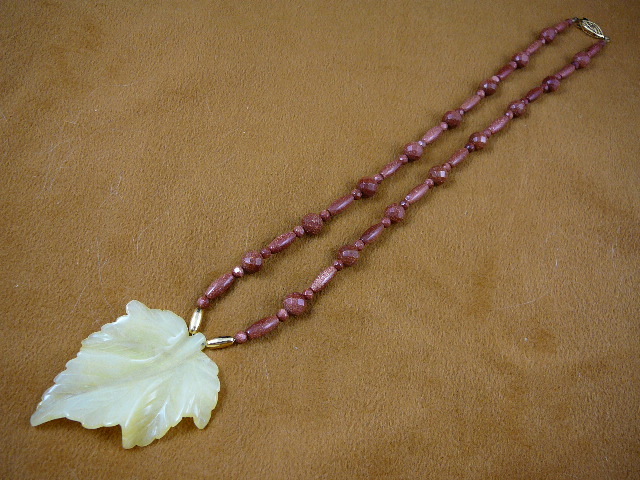 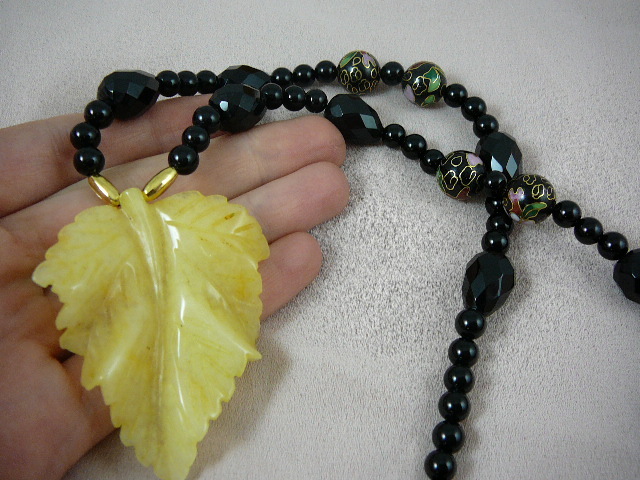 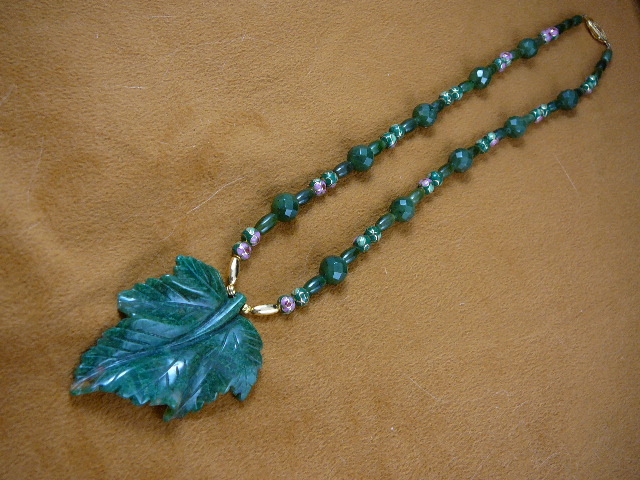 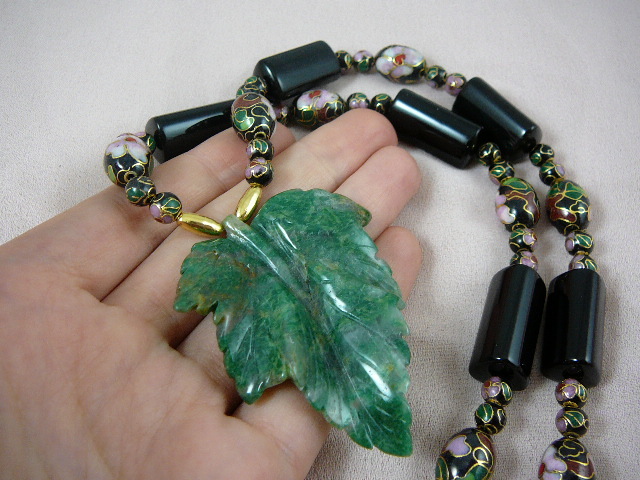 Detailed hand carved gemstone leaf pendants (large leaf is 2-1/4" long x 1-7/8" wide, on gemstone bead necklaces. 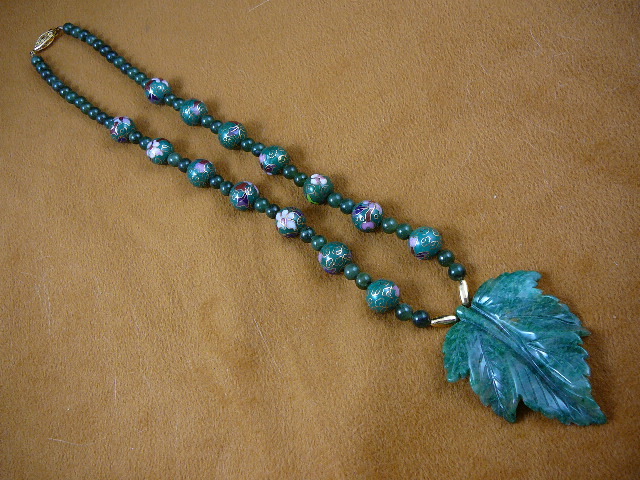 Watch for just PENDANTS that will be listed soon! 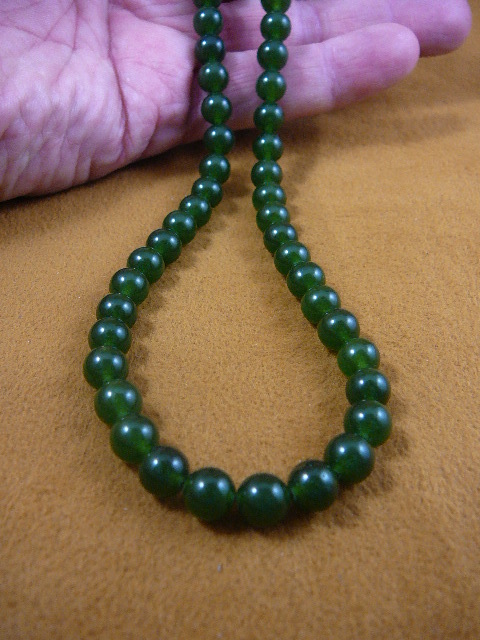 #V-308-10 Jade round bead 6 mm, gold safety closure. 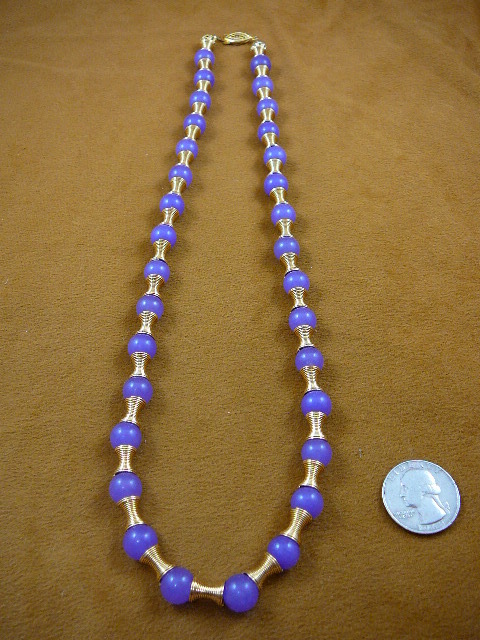 * Larger than 20", special order is $3.00 per inch. 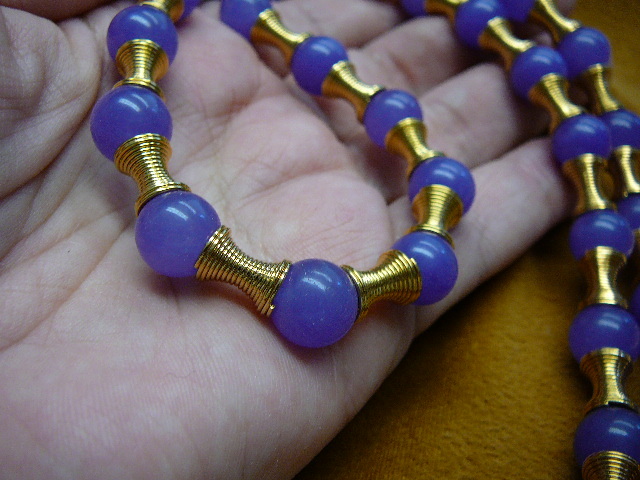 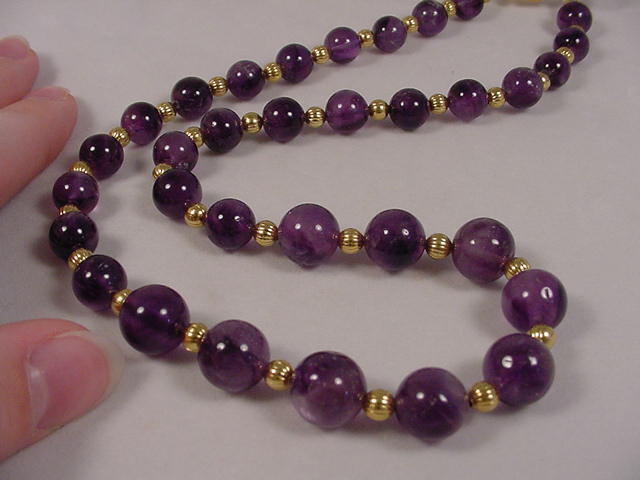 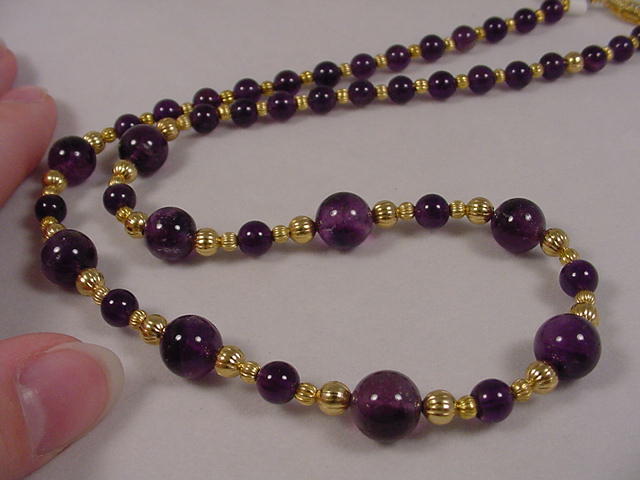 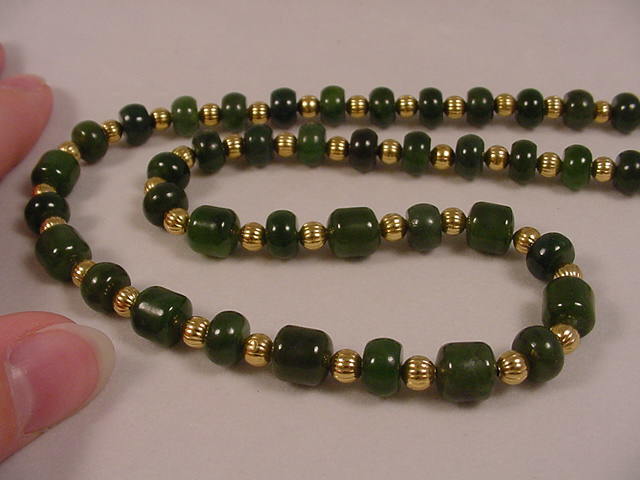 #V-308-11 Jade round bead 8 mm, gold safety closure, 16" long. 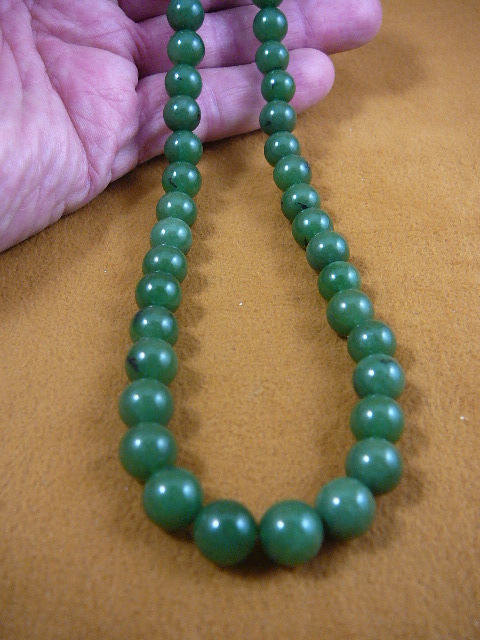 same as above design #V-308-12A Jade (light green) round bead 10 mm, gold safety closure, 18" long. 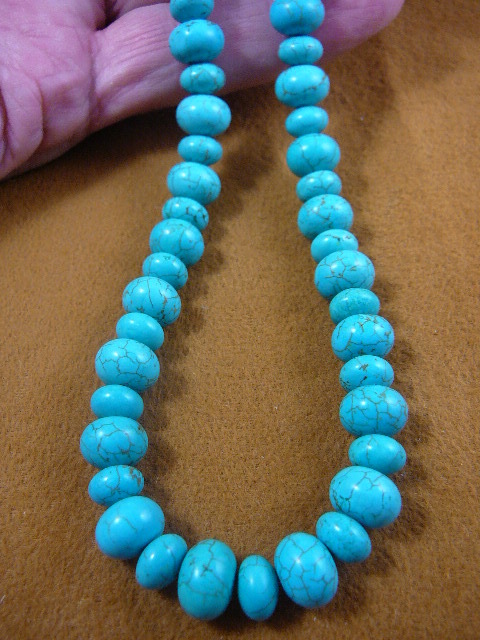 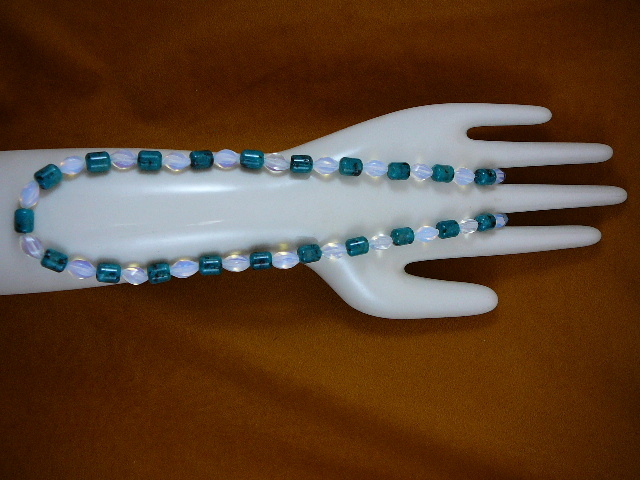 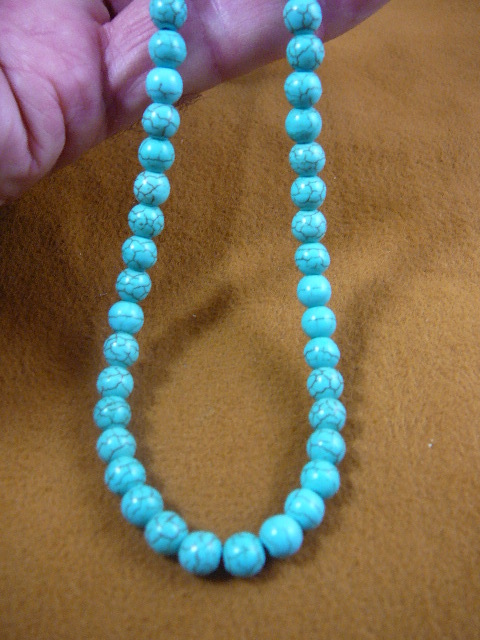 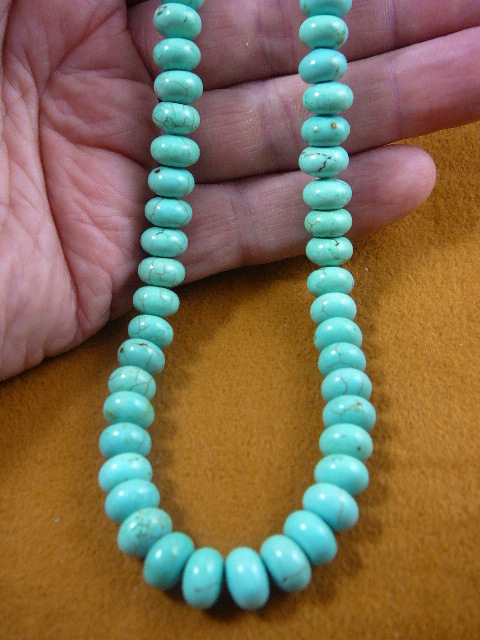 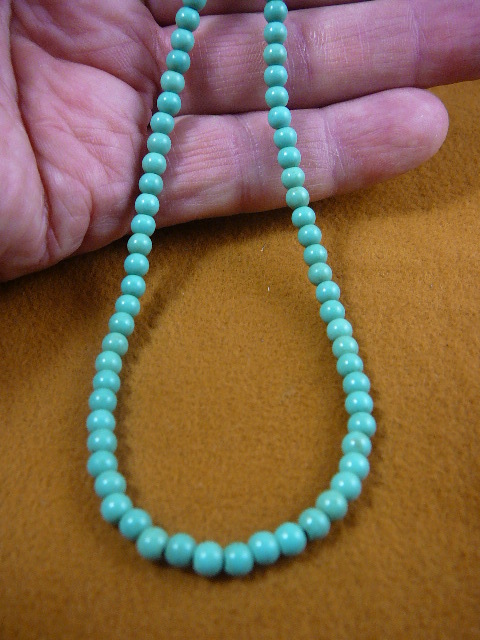 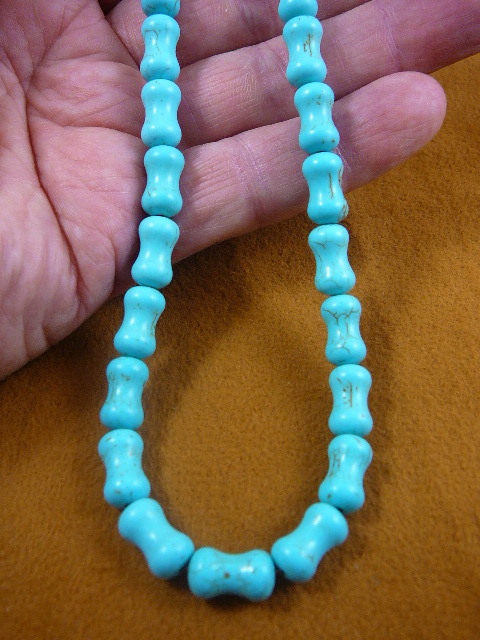 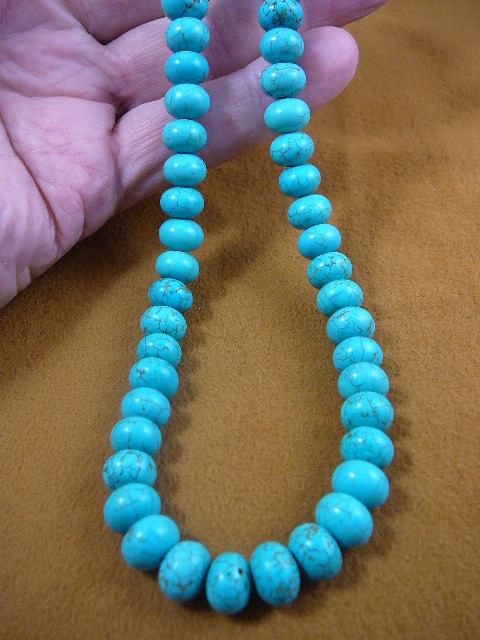 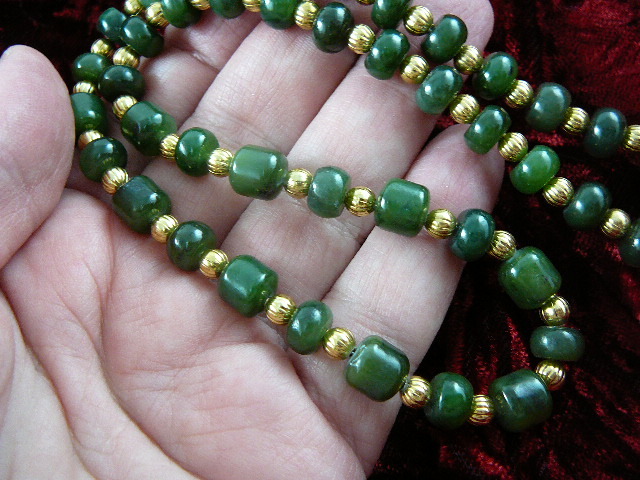 same as above design #V-308-12B Jade (light green) round bead 10 mm, gold safety closure, 20" long. 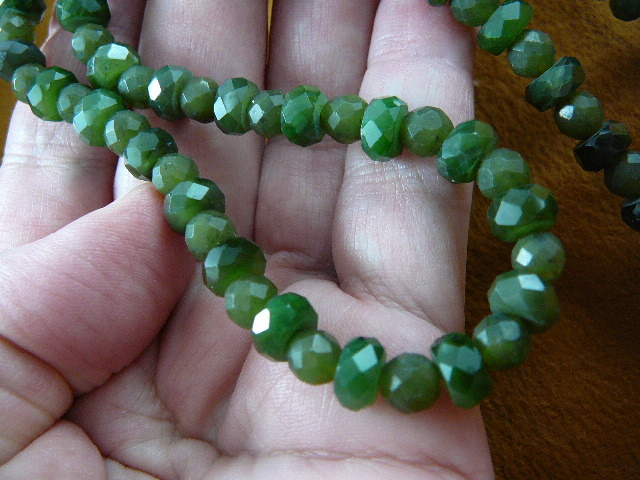 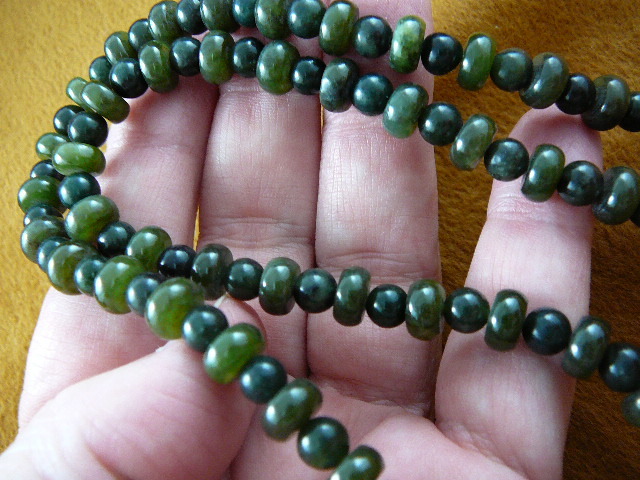 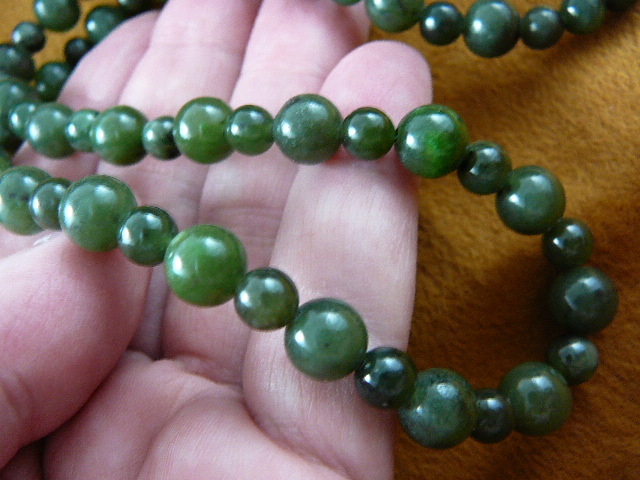 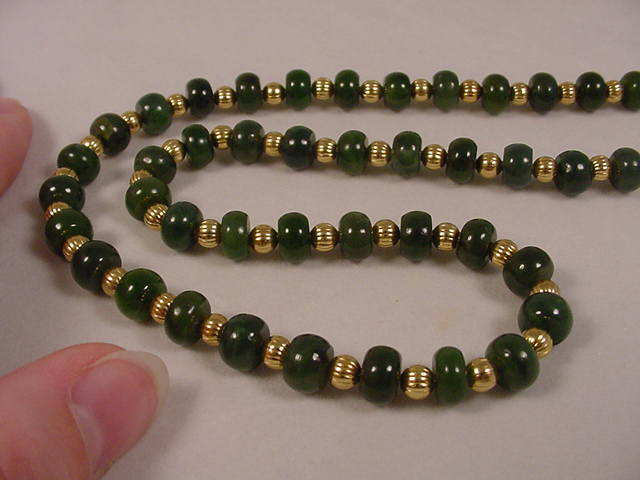 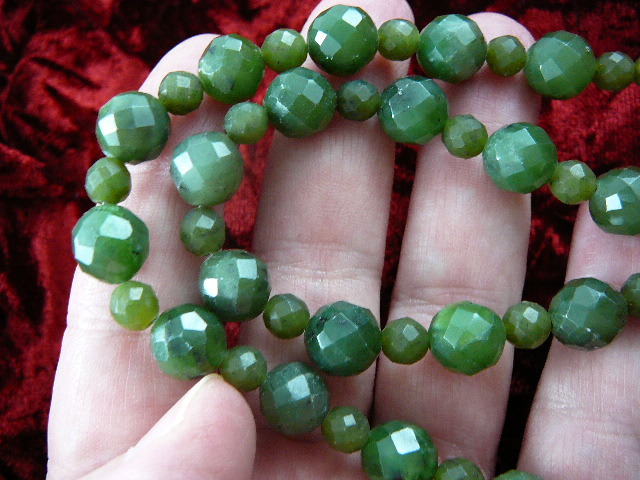 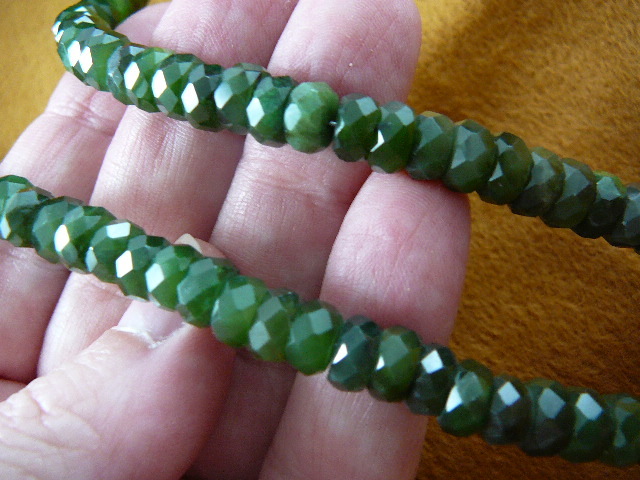 #V-308-13 Jade (dark green) round bead 10 mm, gold safety closure, 16" long. 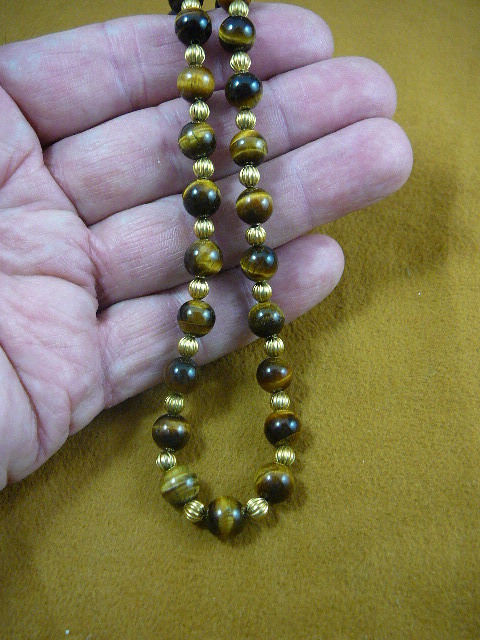 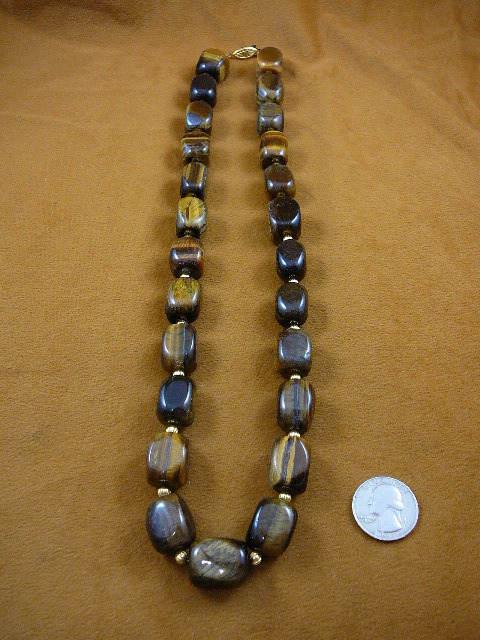 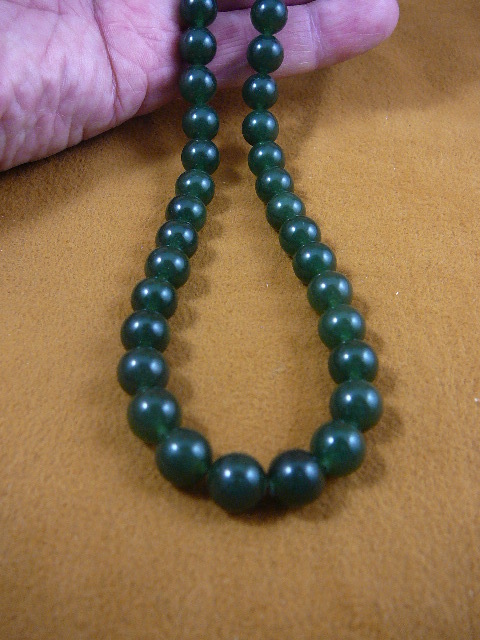 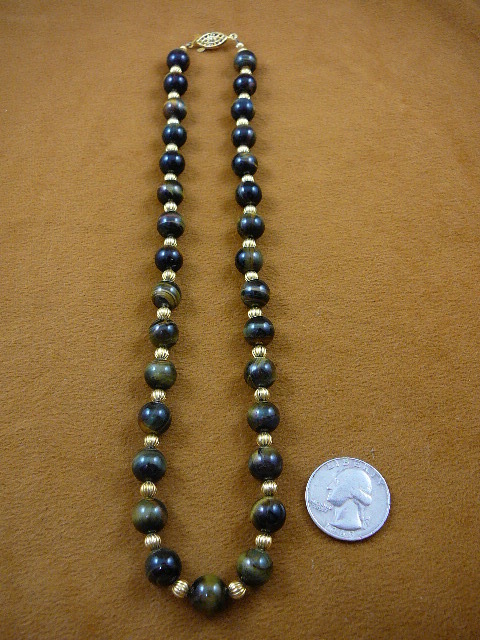 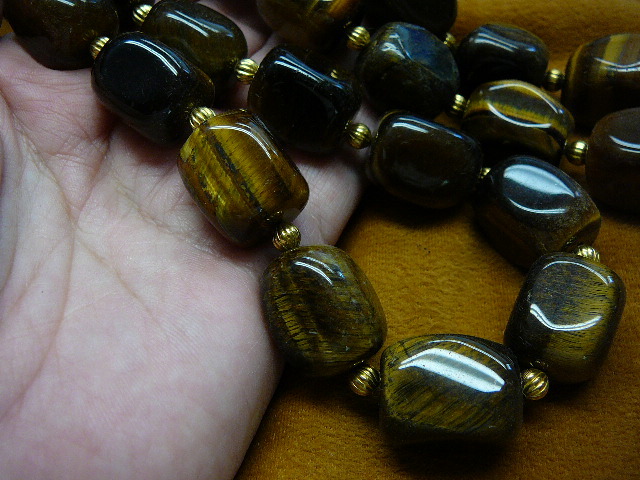 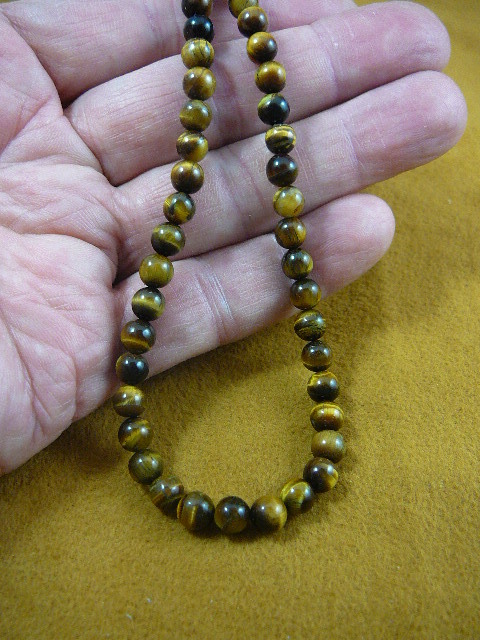 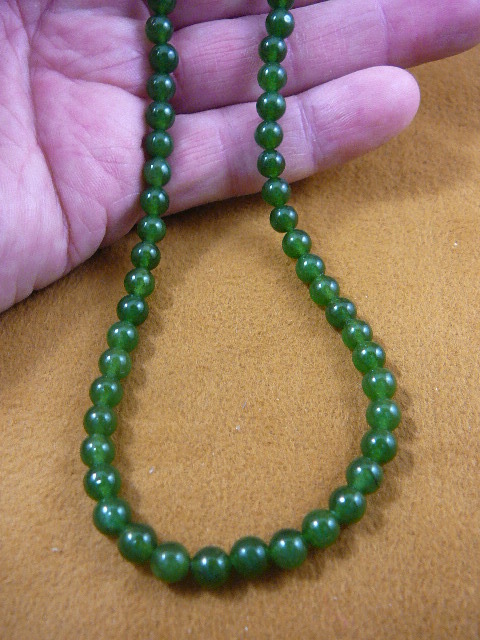 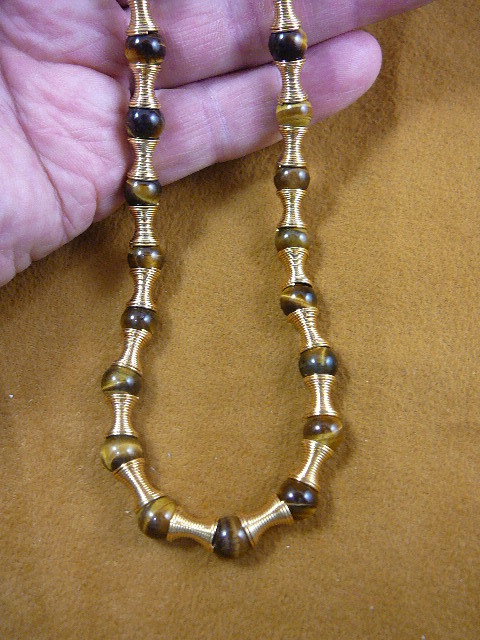 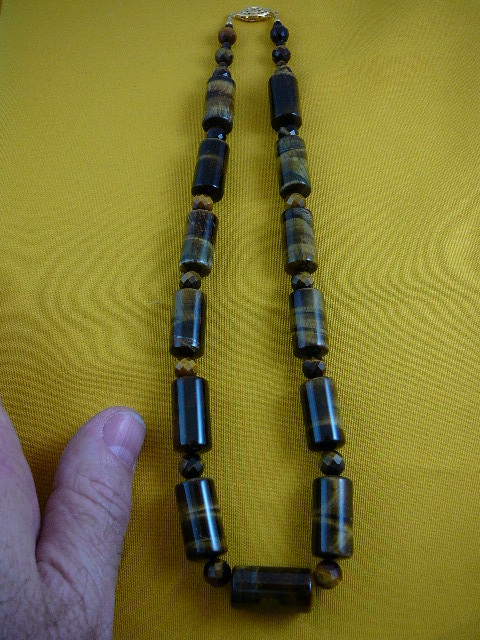 same as above design #V-308-13A Jade (dark green) round bead 10 mm, gold safety closure, 18" long. 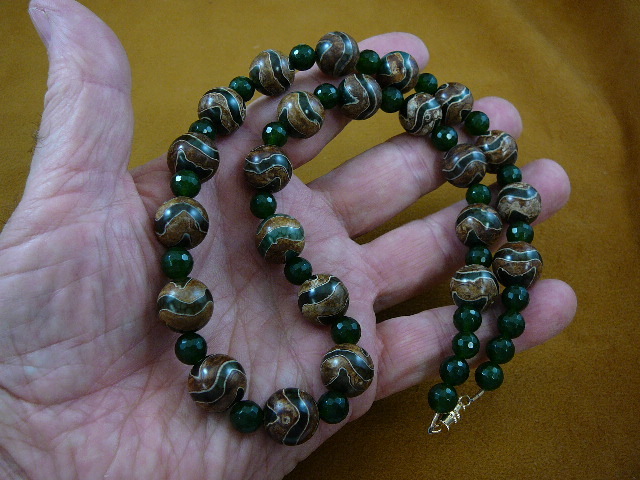 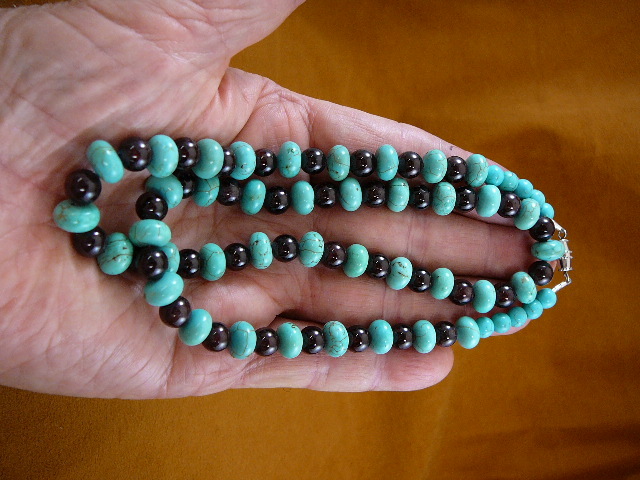 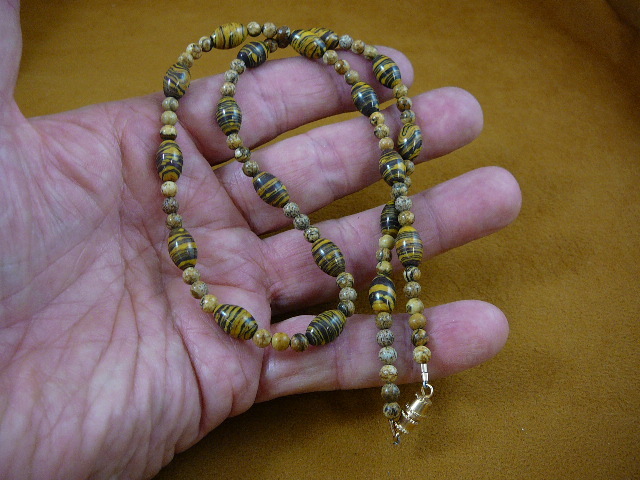 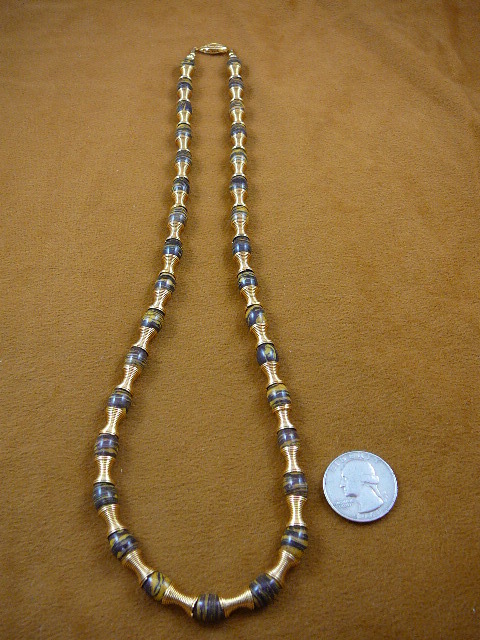 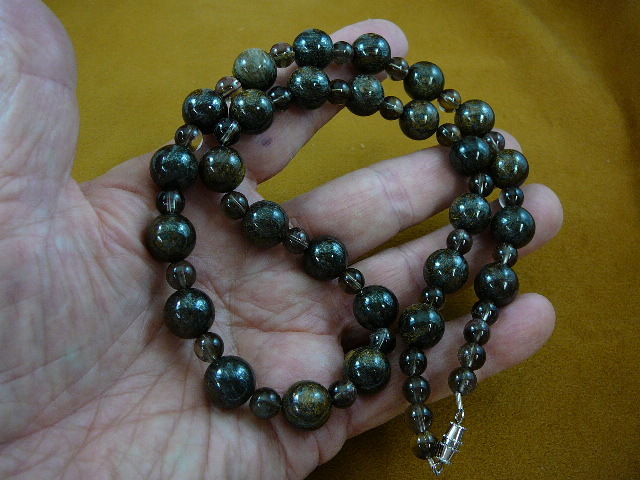 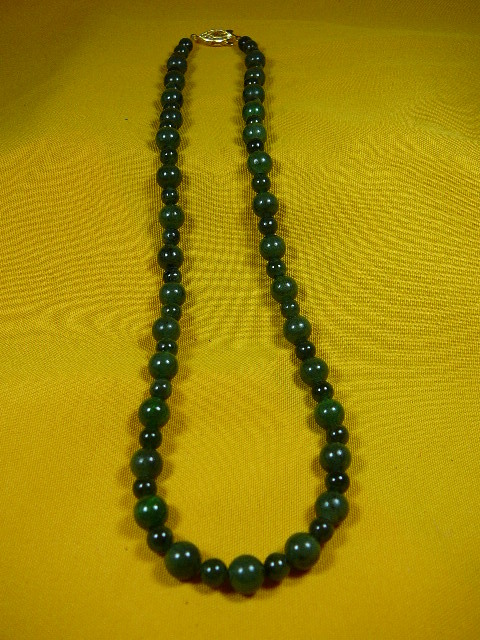 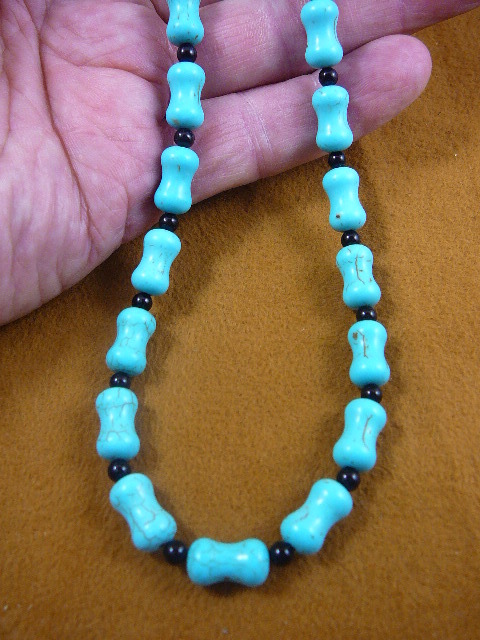 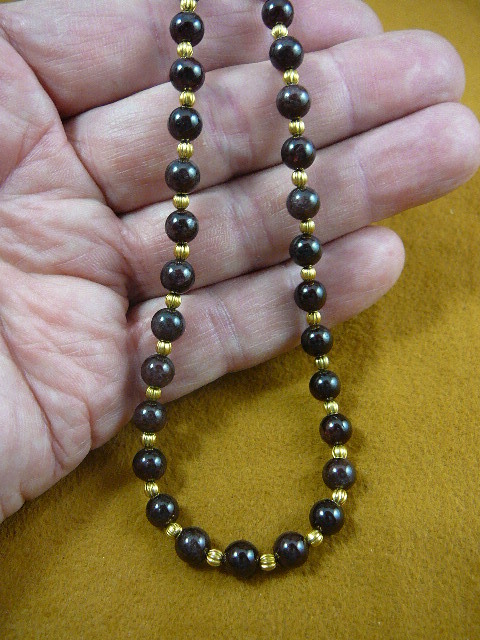 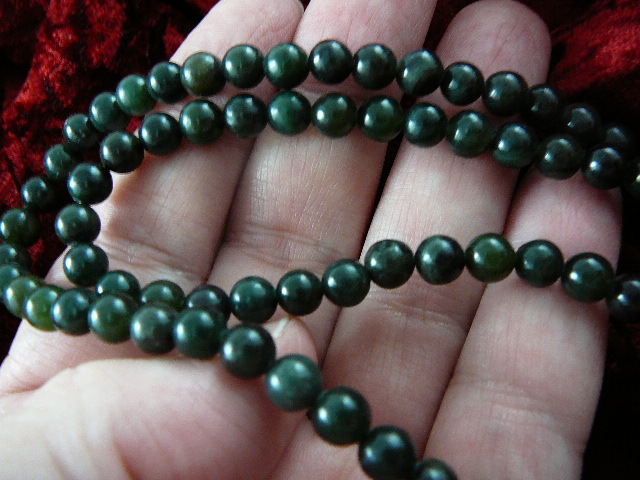 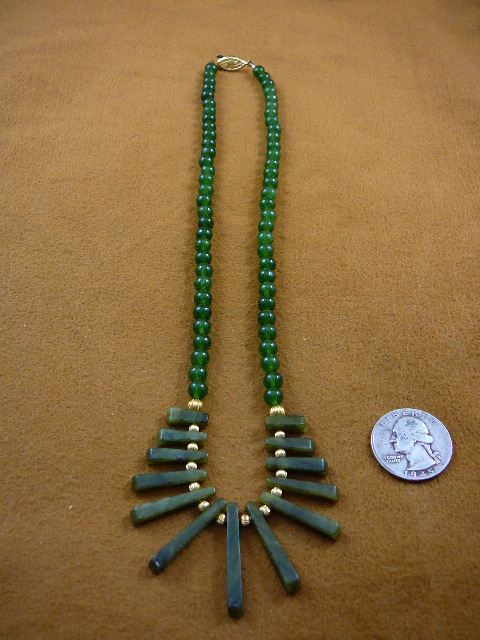 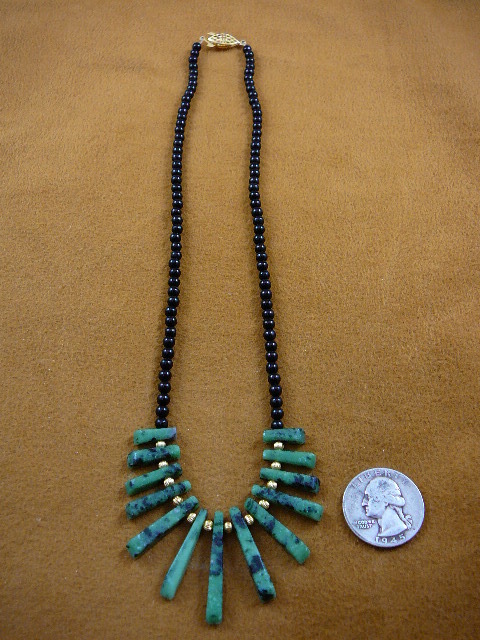 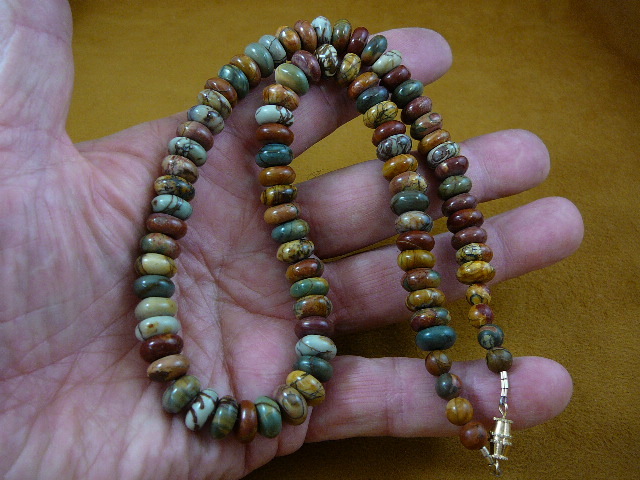 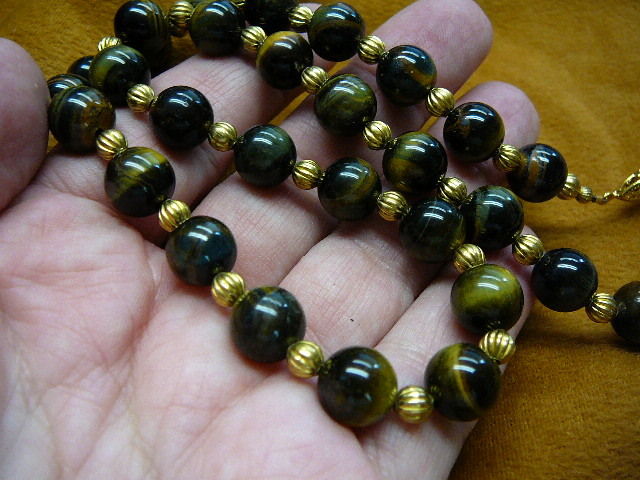 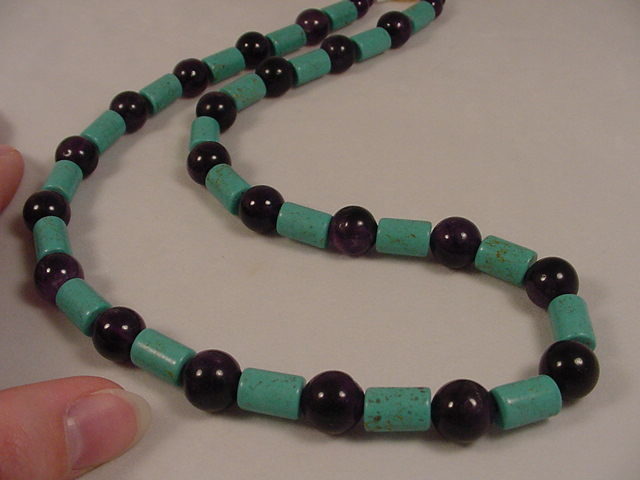 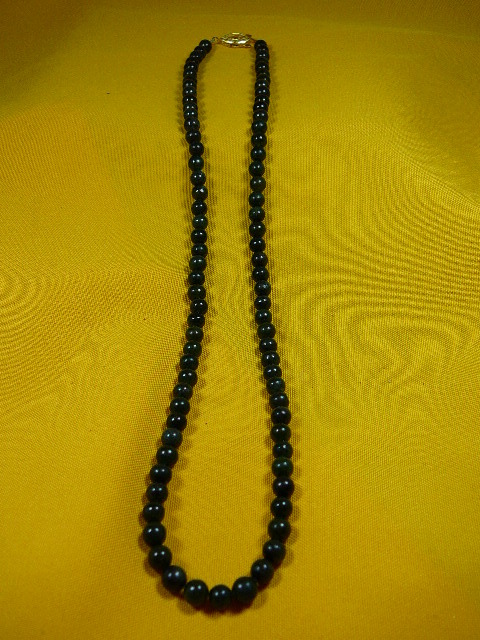 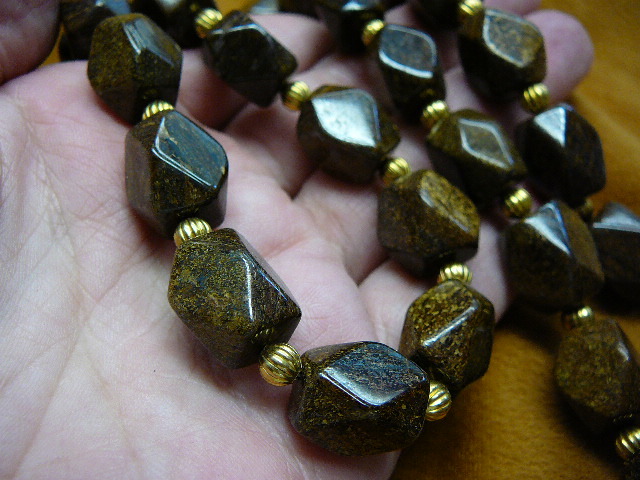 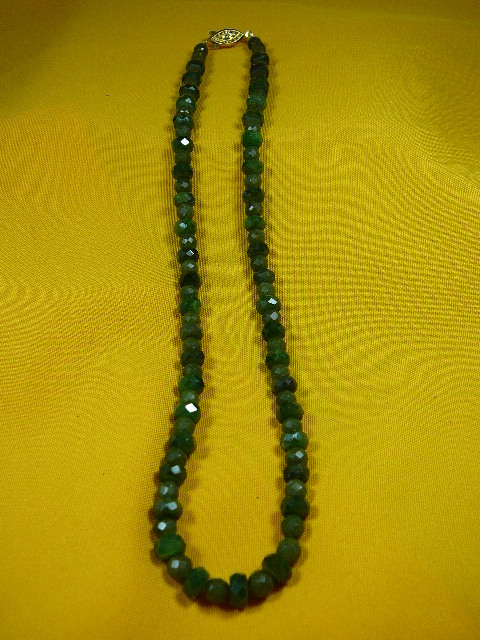 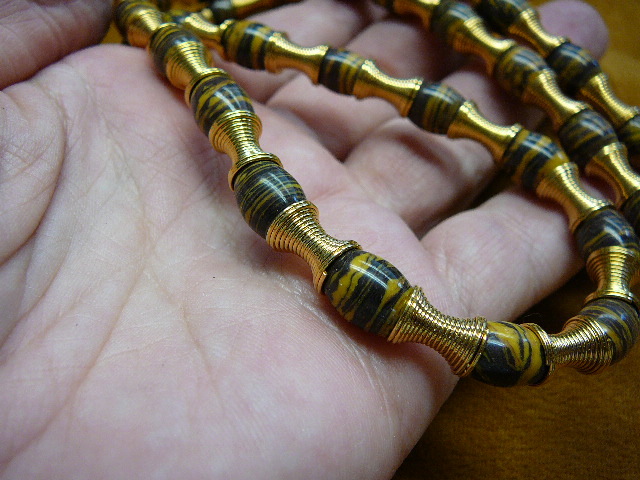 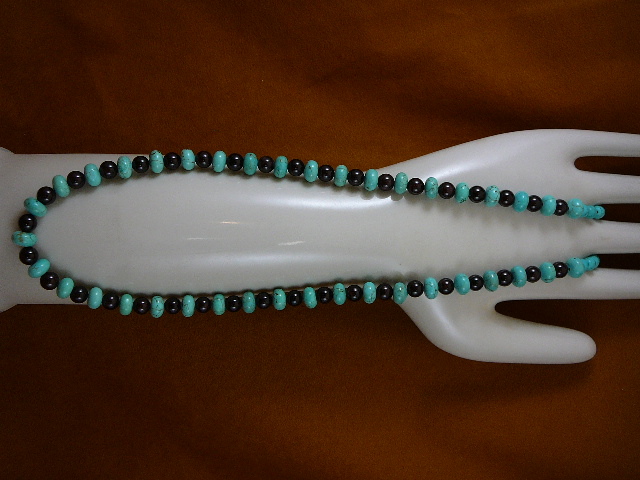 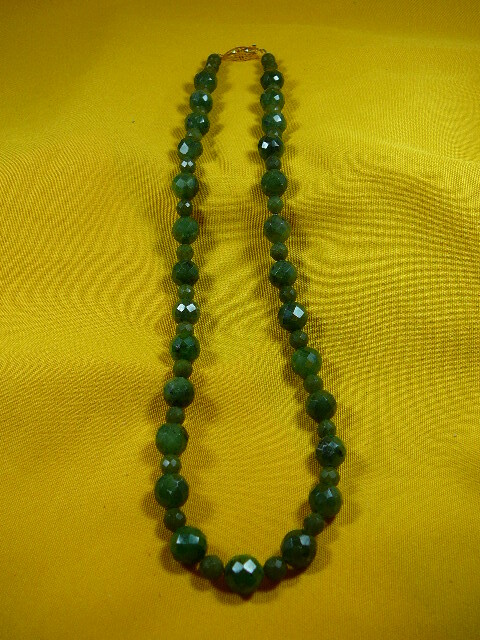 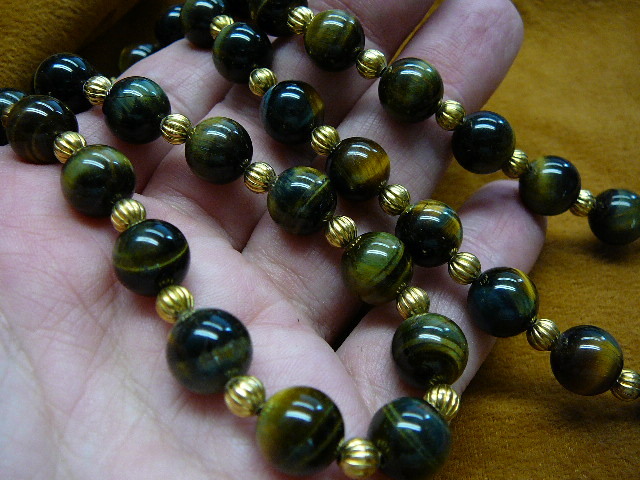 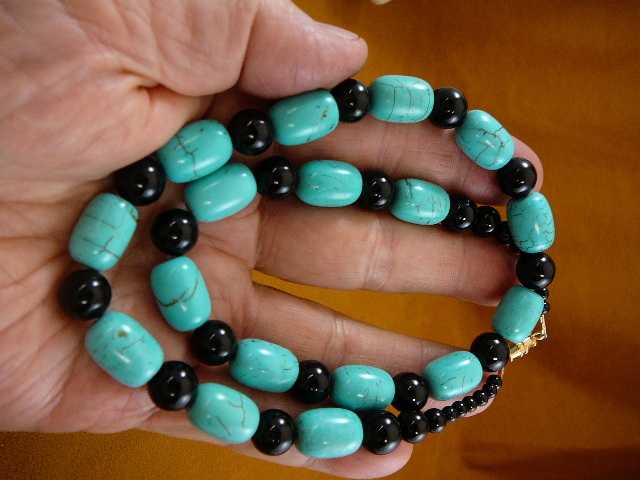 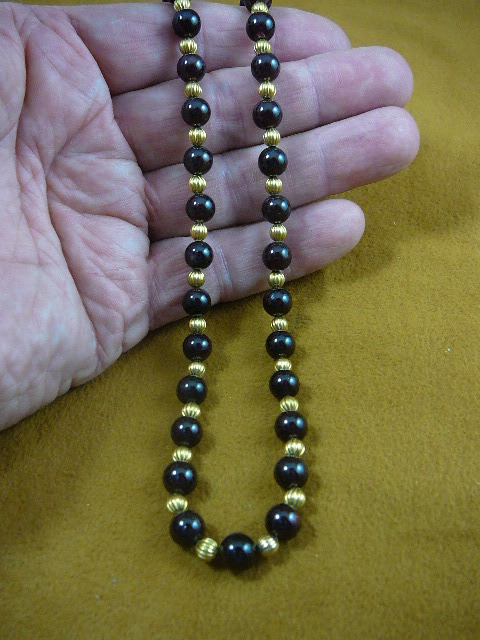 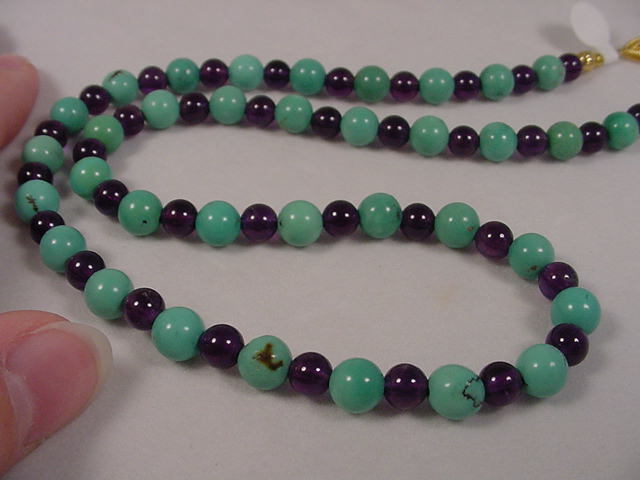 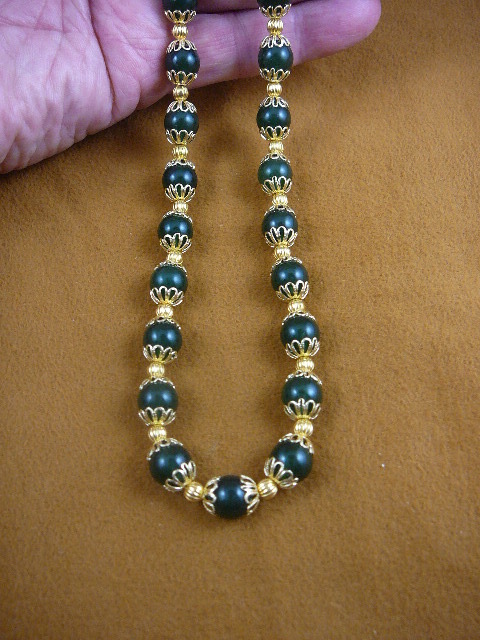 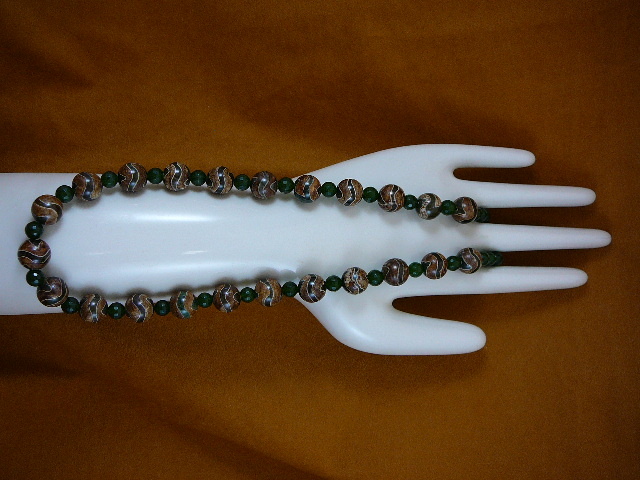 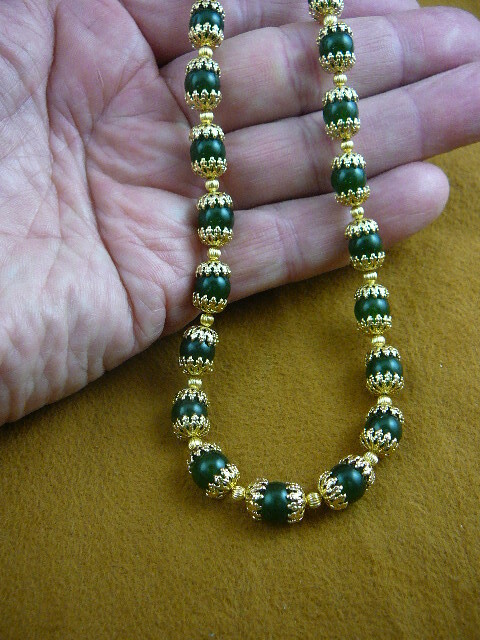 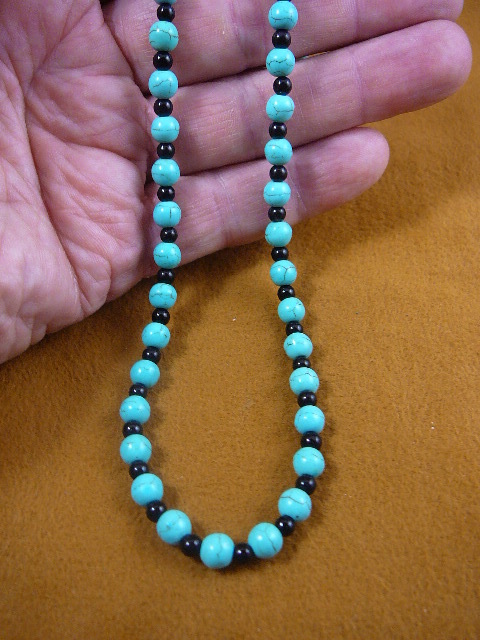 same as above design #V-308-13D Jade (dark green) round bead 10 mm, gold safety closure, 30" long. 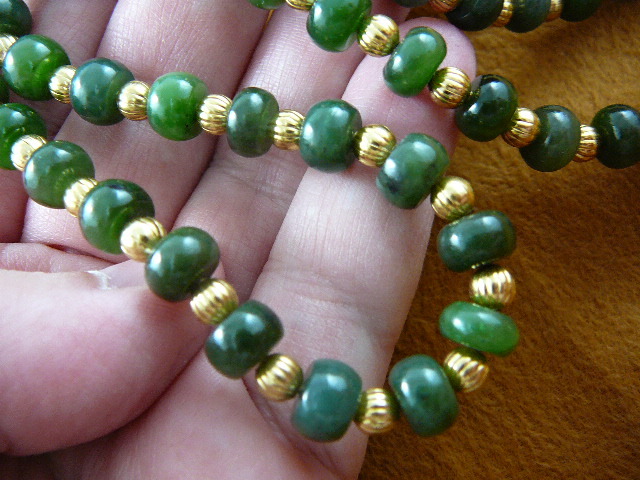 #V-308-14 Jade round bead 6 mm, gold plated 4 mm bead spacers, gold filigree caps, gold safety closure, 16" long. 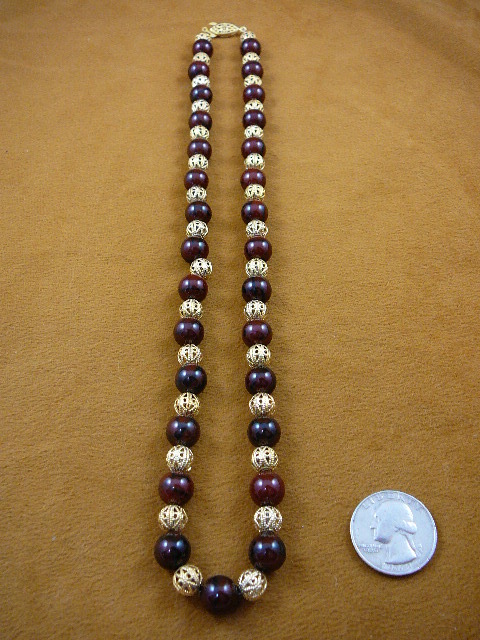 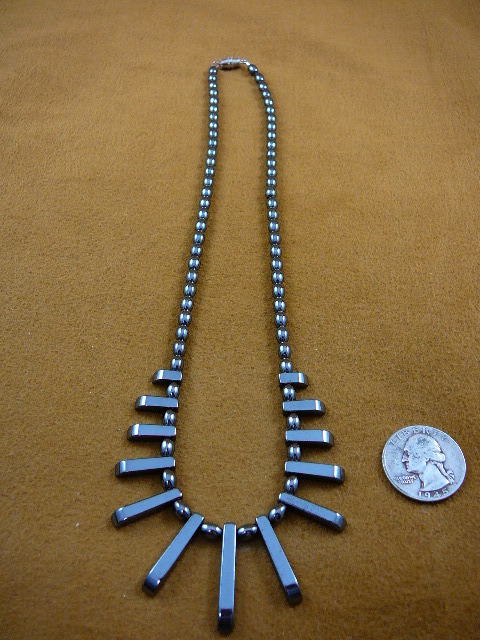 * Larger than 20", special order is $4.00 per inch. 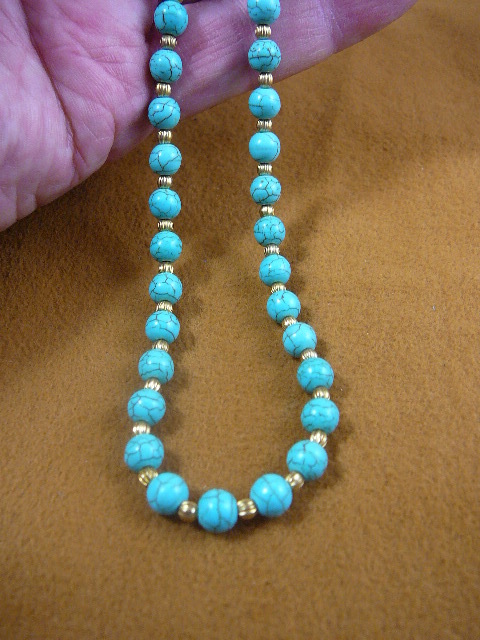 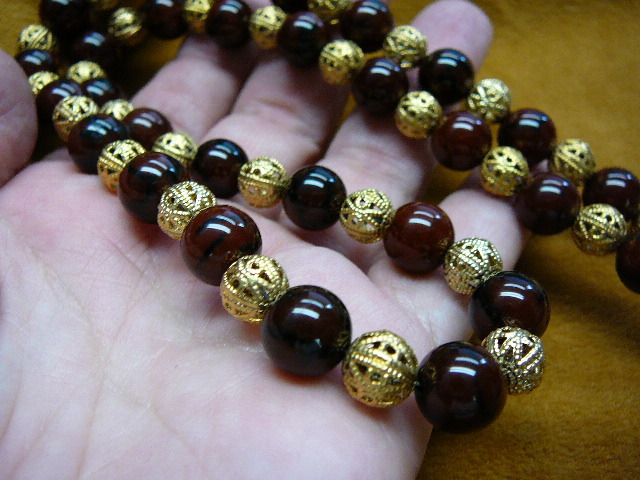 #V-308-15 Jade round bead 8 mm, gold plated 5 mm bead spacers, gold filigree caps, gold safety closure, 16" long. 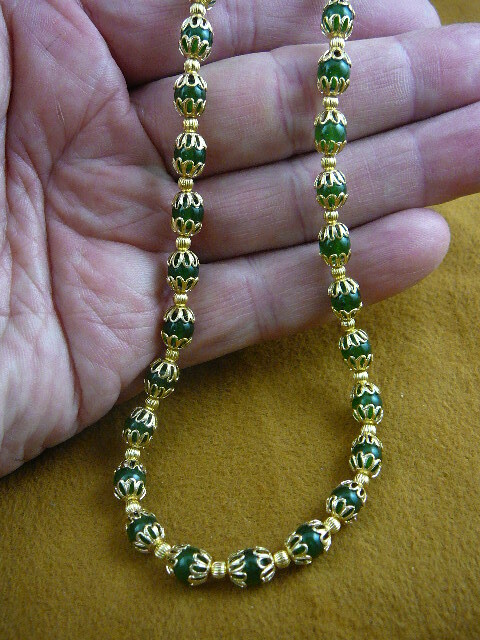 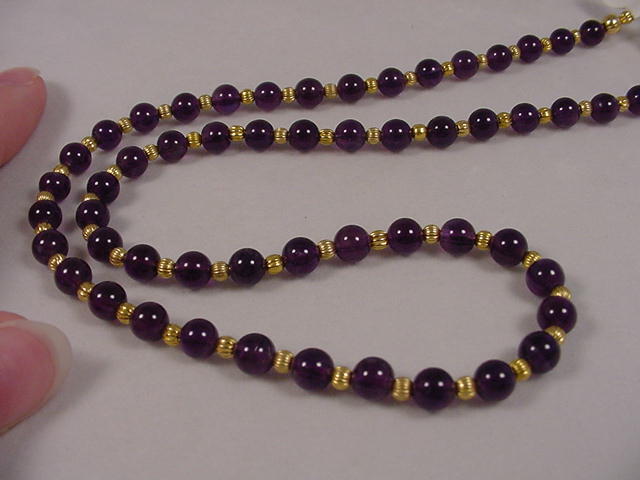 #V-308-16 Jade round bead 10 mm, gold plated 5 mm bead spacers, gold filigree caps, gold safety closure, 16" long. 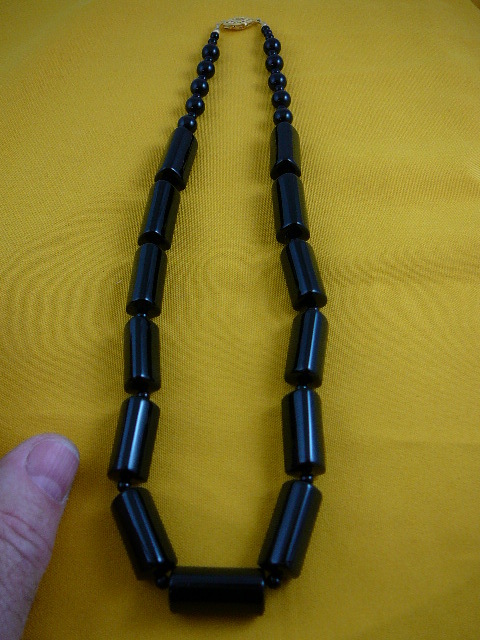 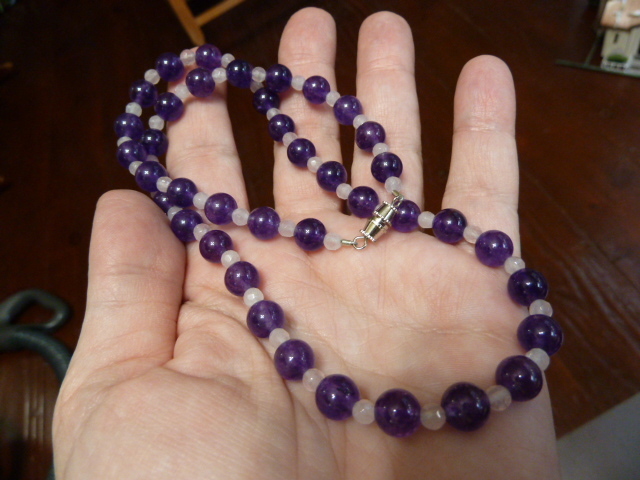 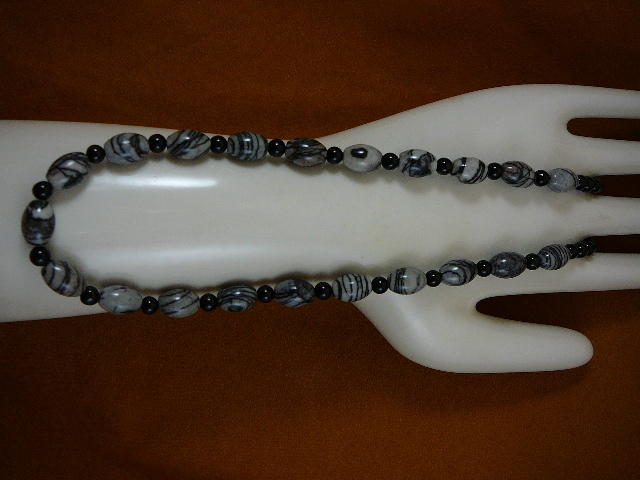 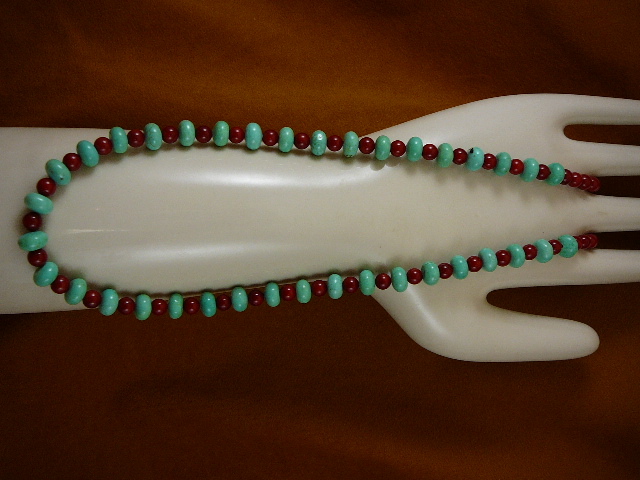 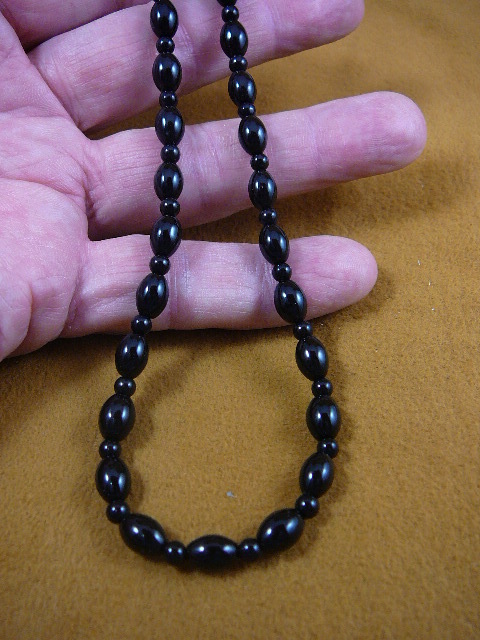 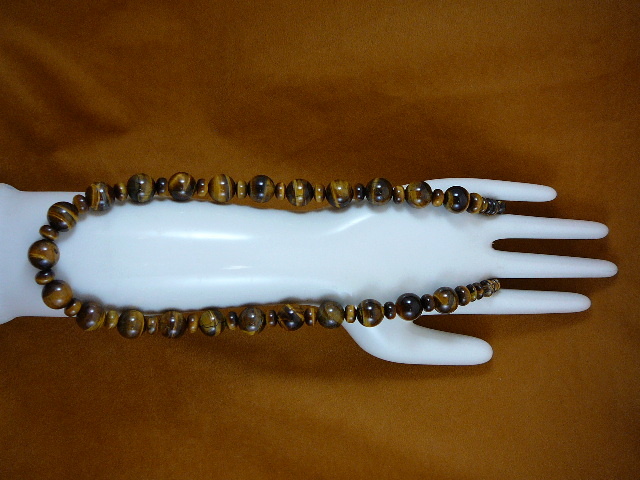 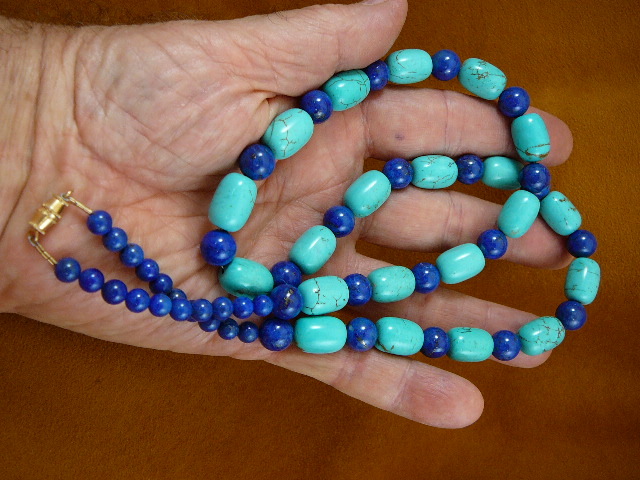 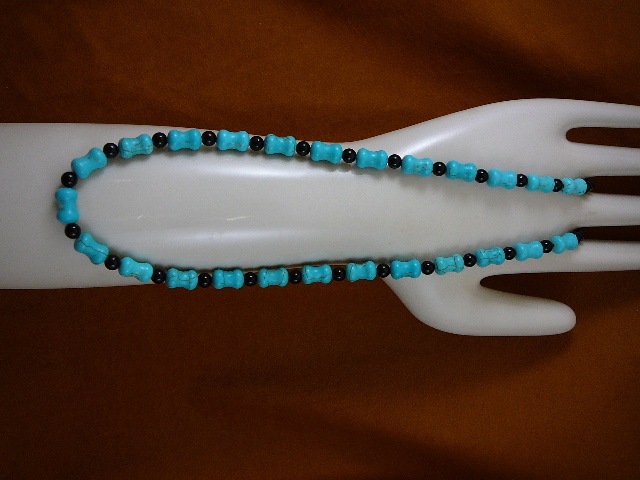 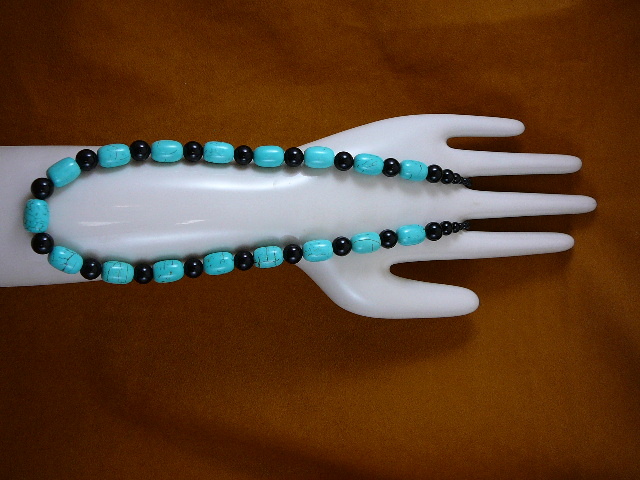 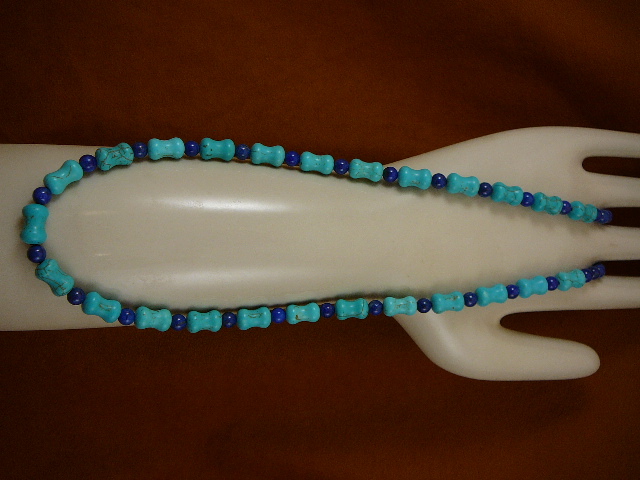 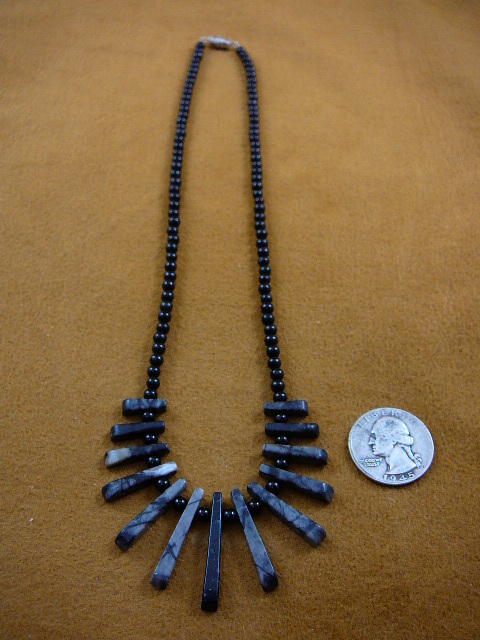 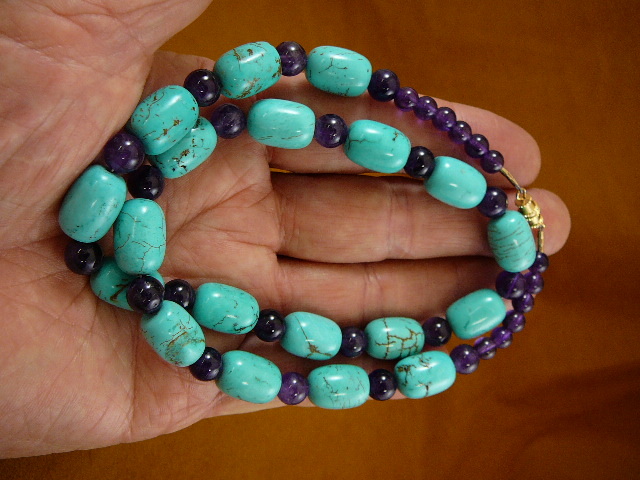 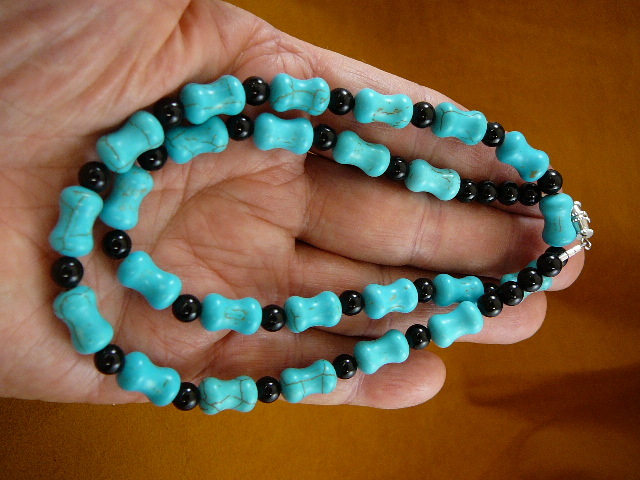 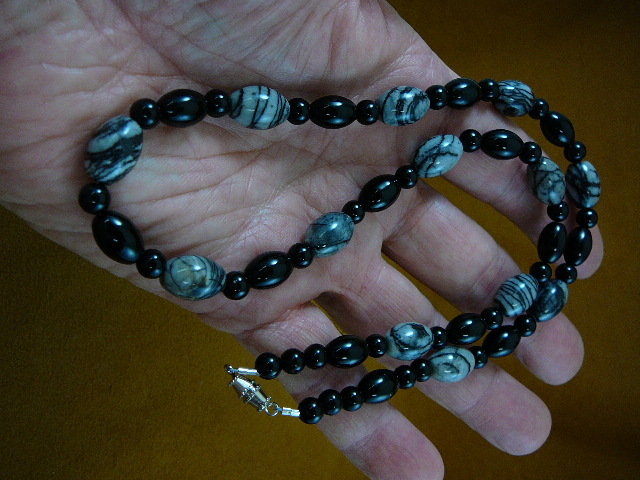 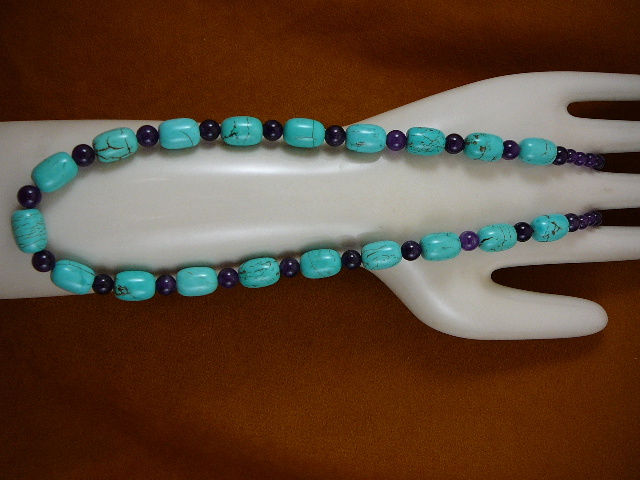 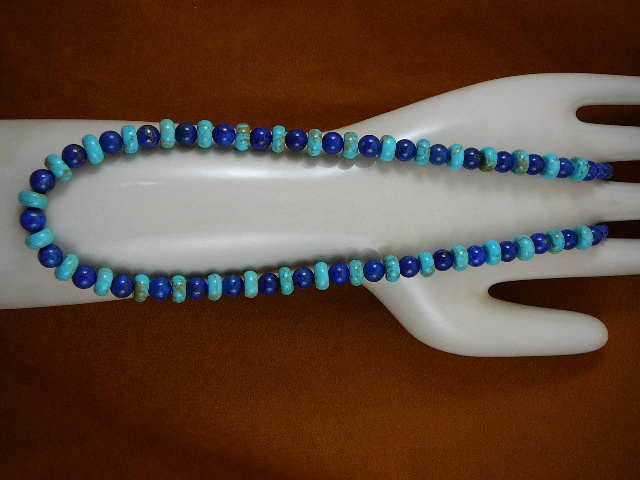 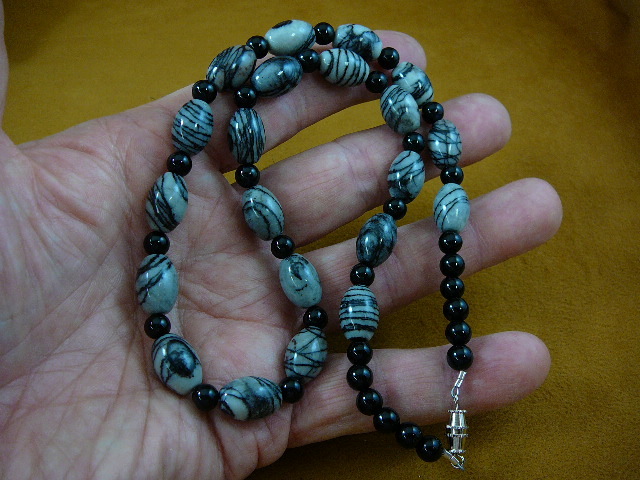 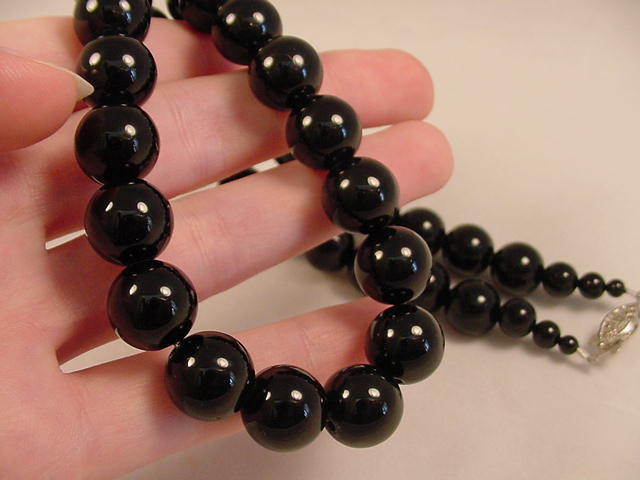 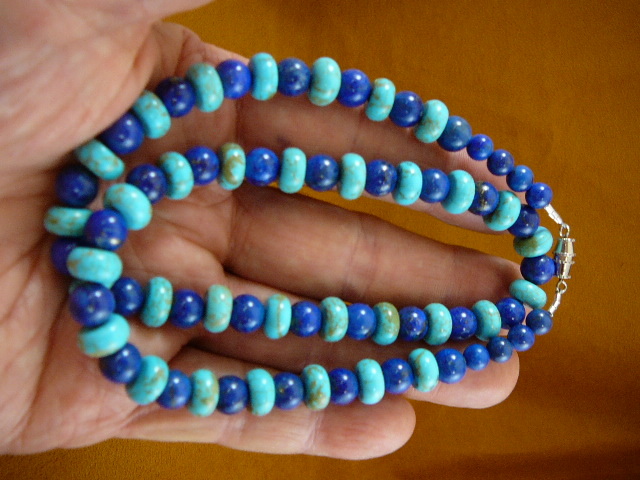 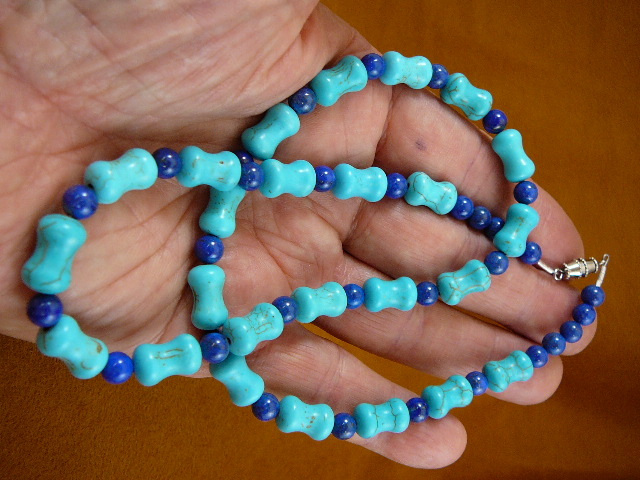 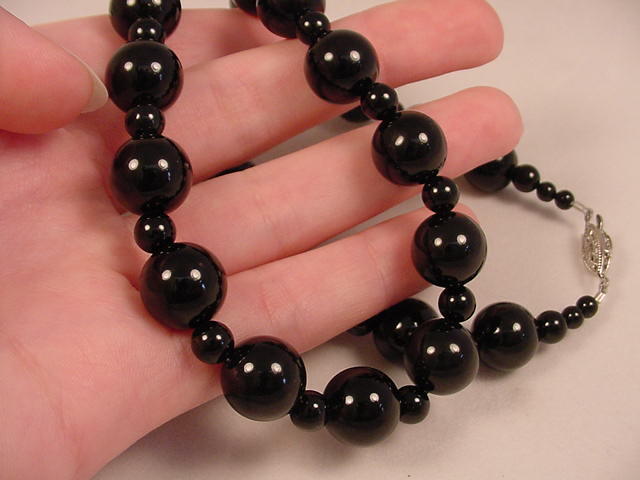 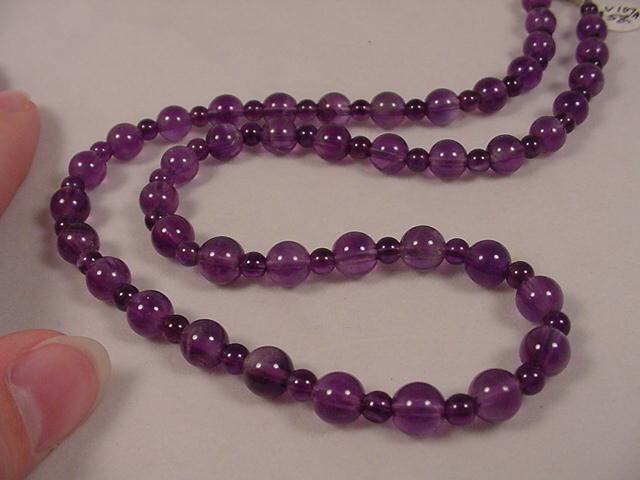 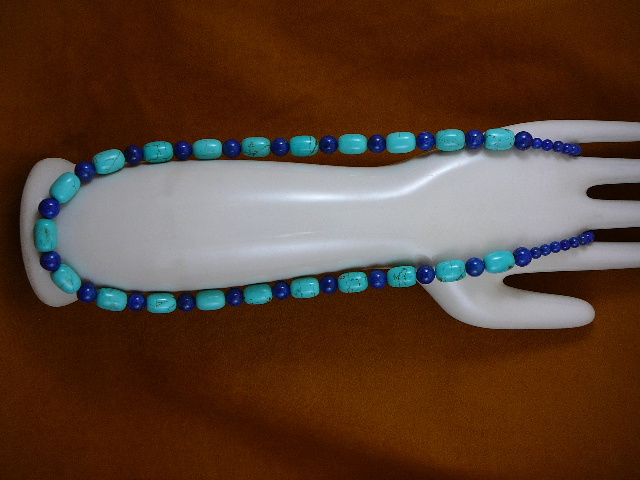 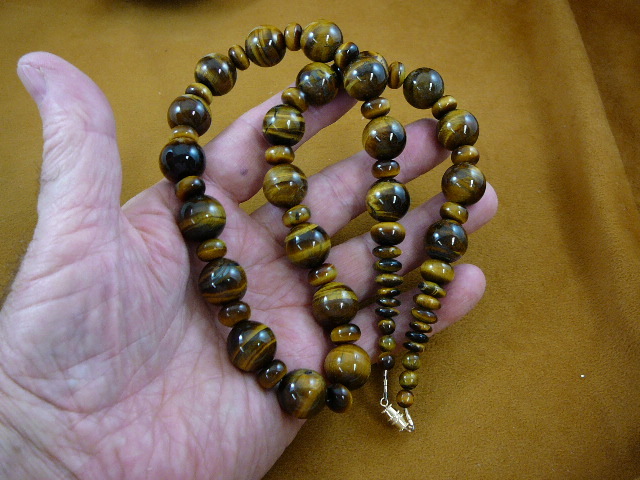 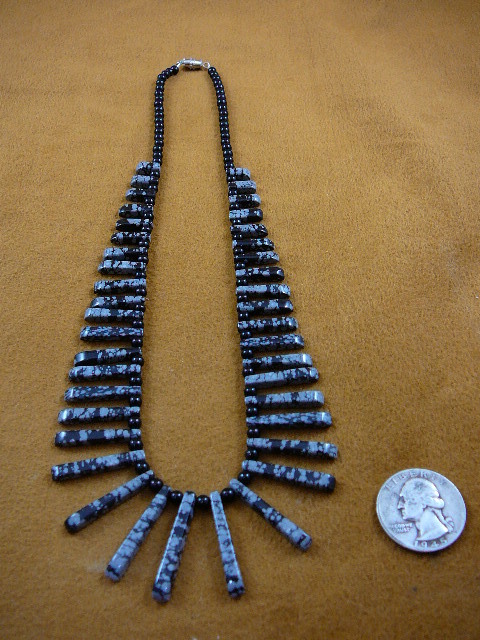 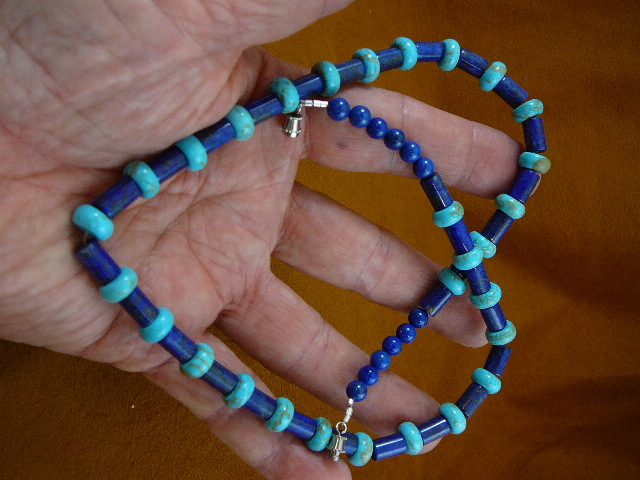 * Larger than 20", special order is $2.60 per inch. 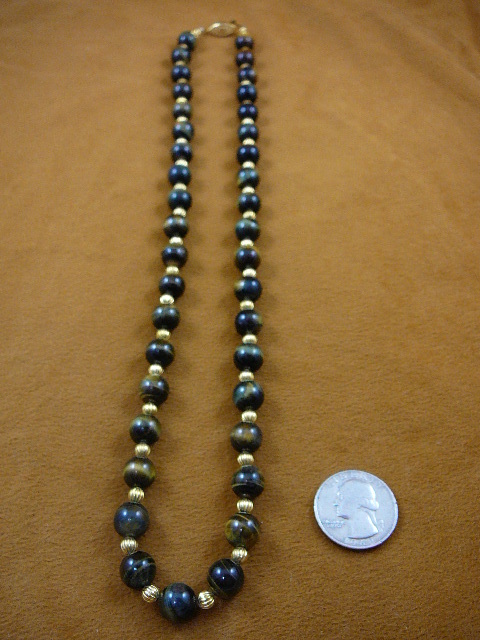 * Larger than 20", special order is $3.50 per inch. 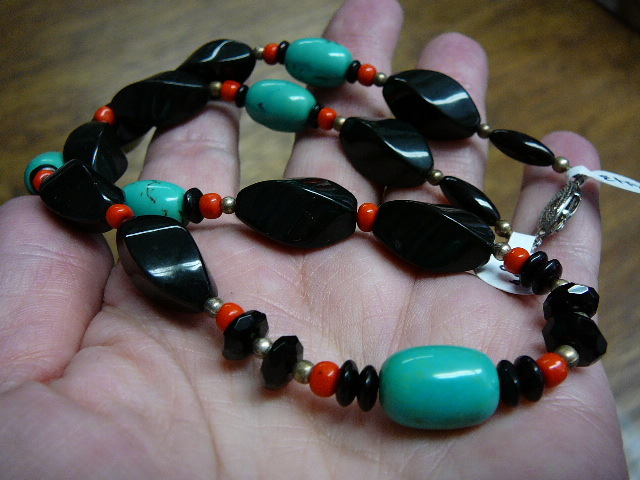 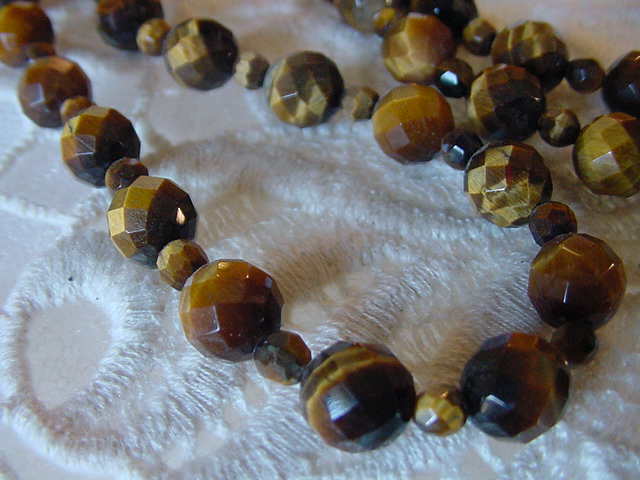 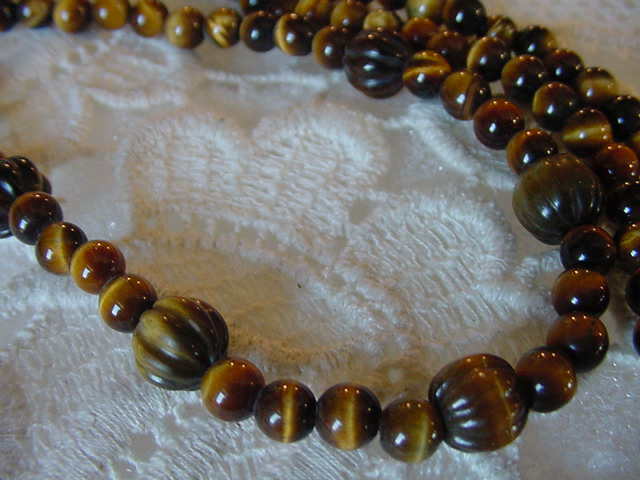 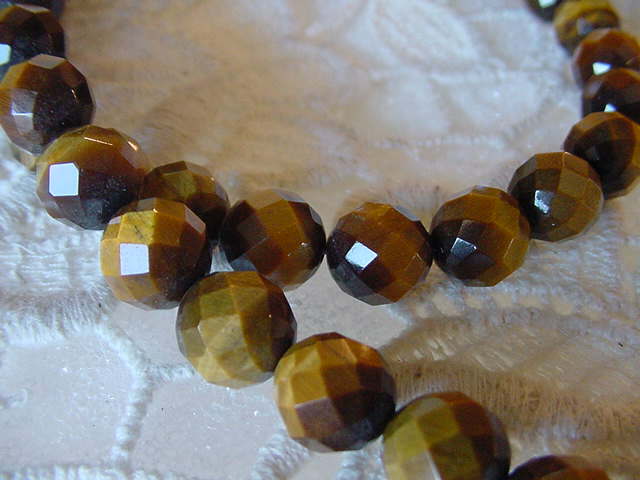 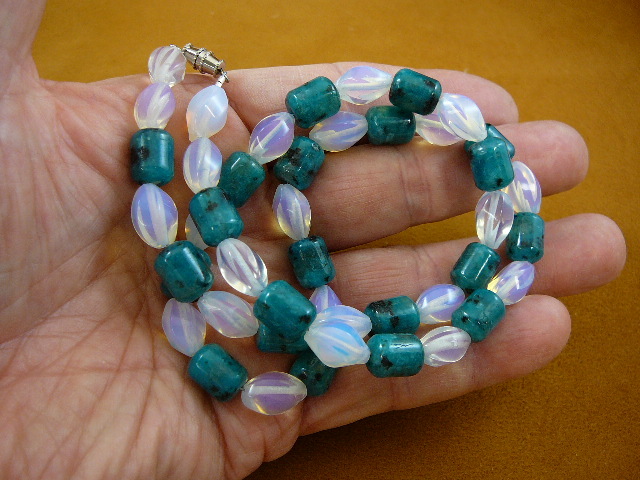 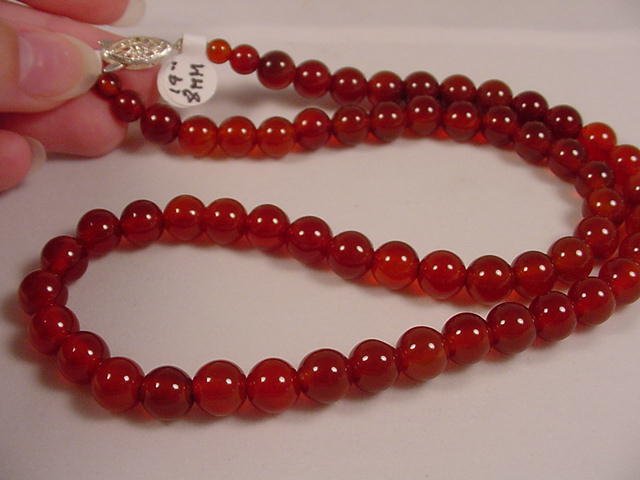 Also called Sardonyx or Chalcedony (mico-crystalline quartz), not dyed. 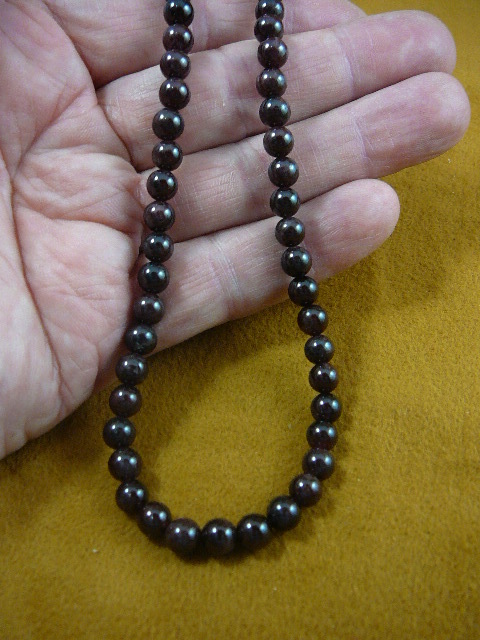 #V-319. 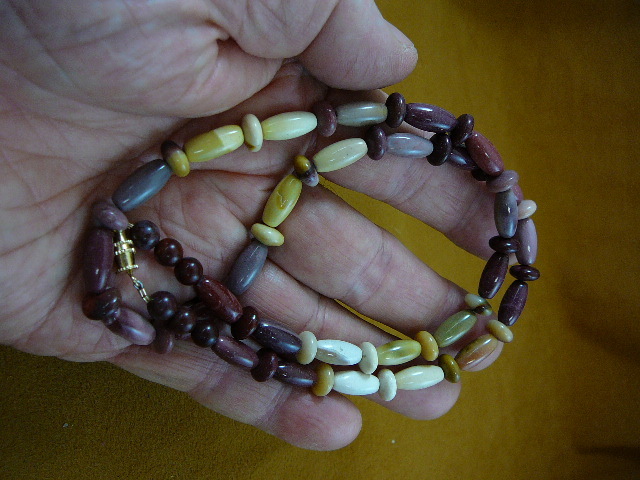 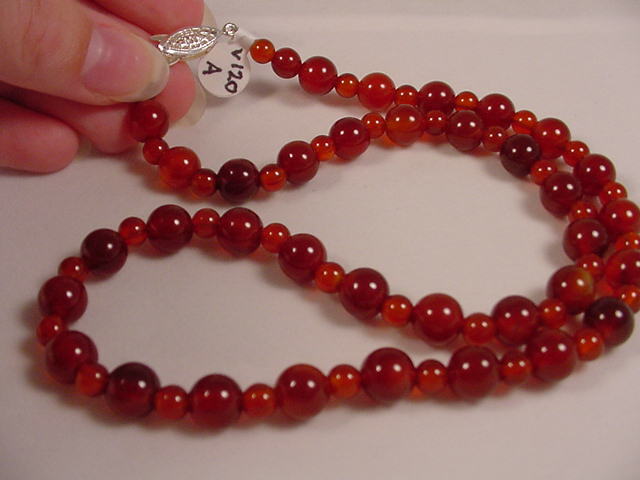 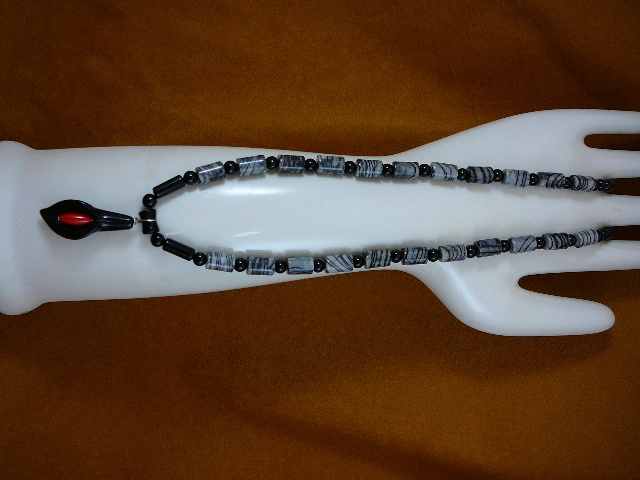 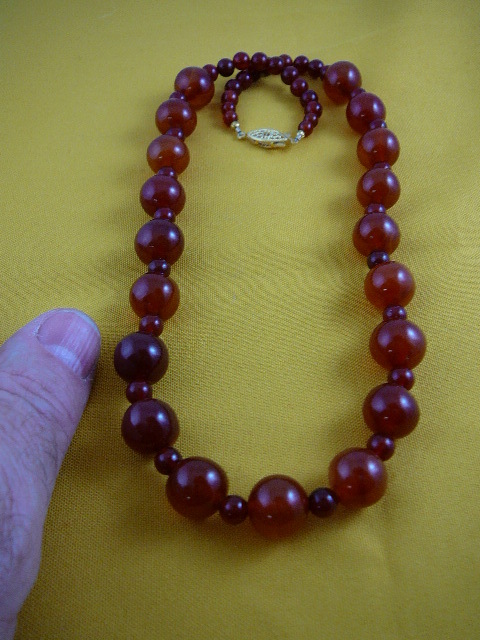 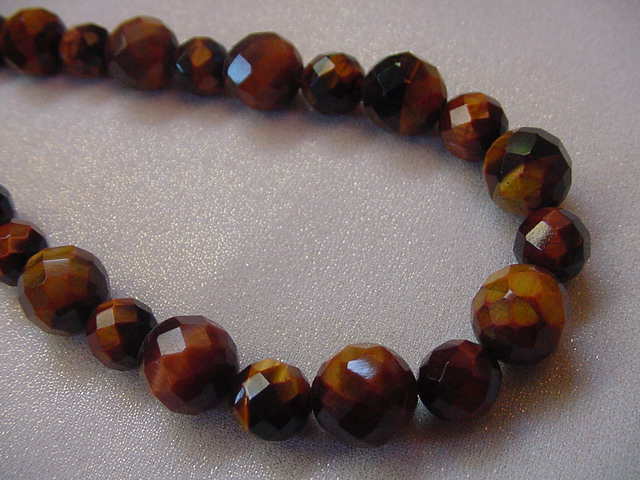 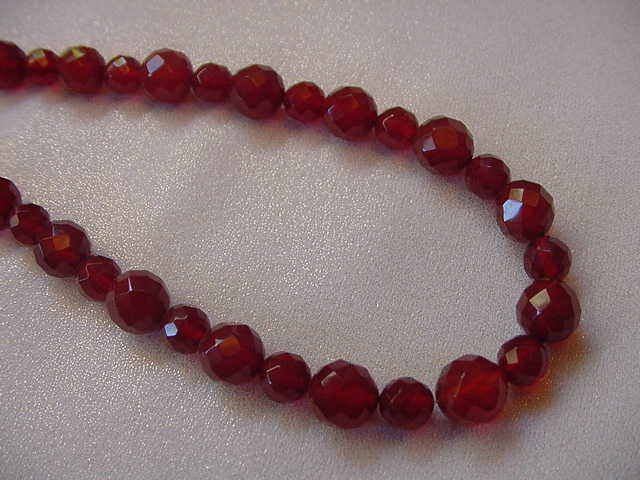 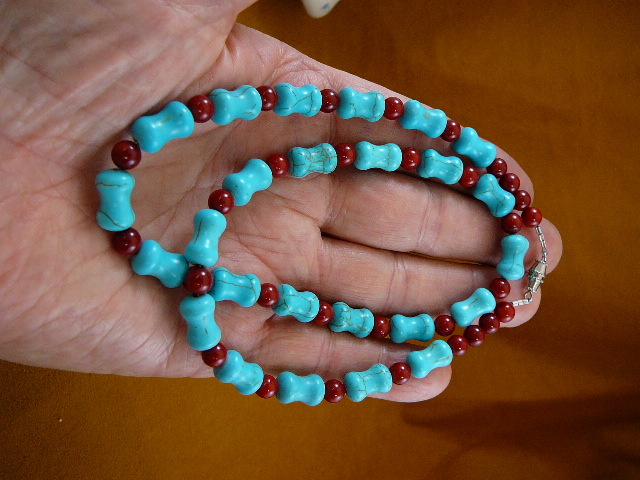 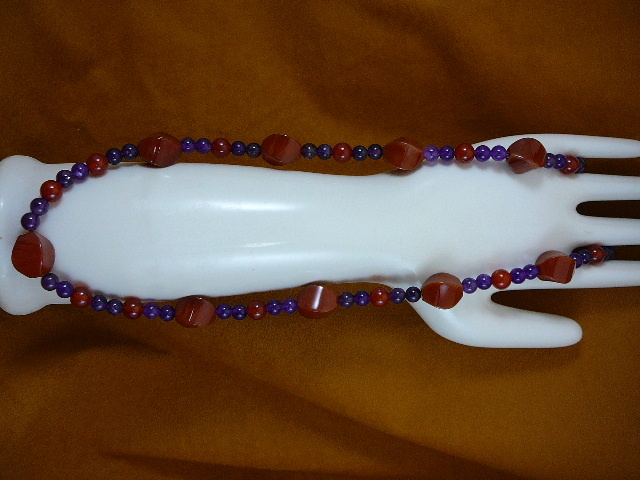 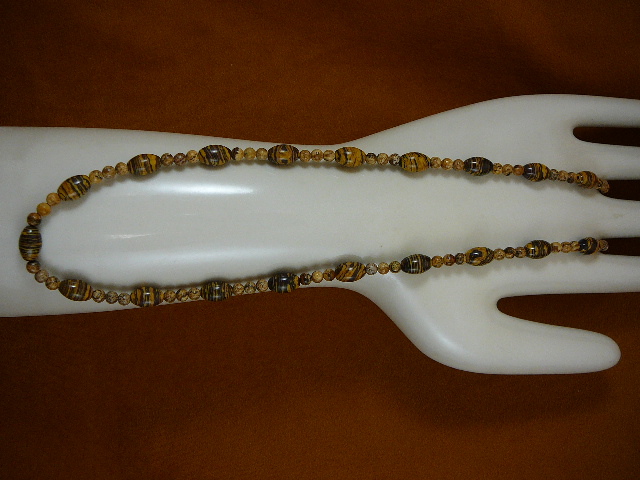 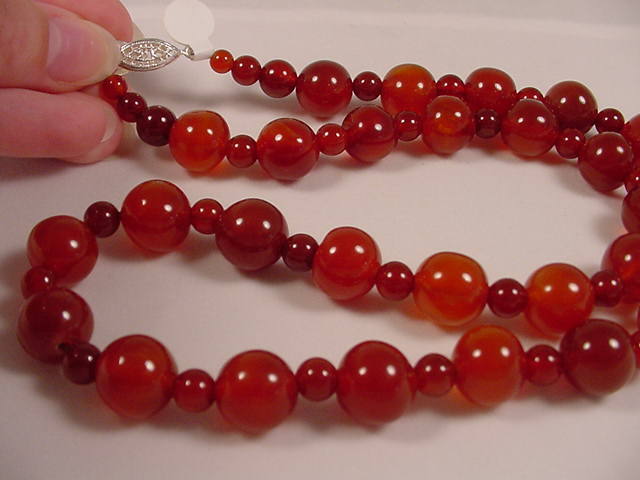 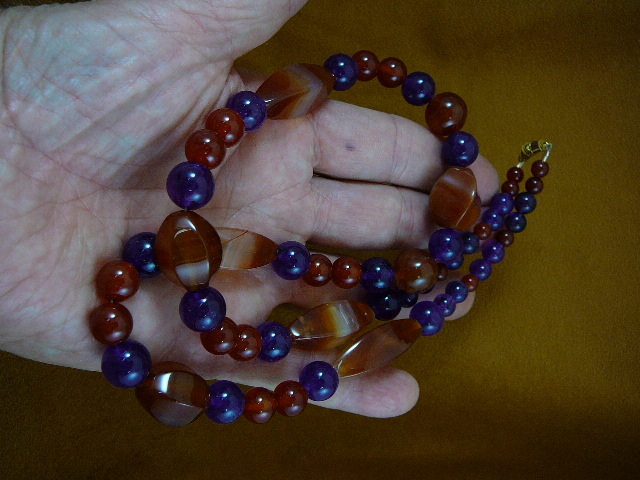 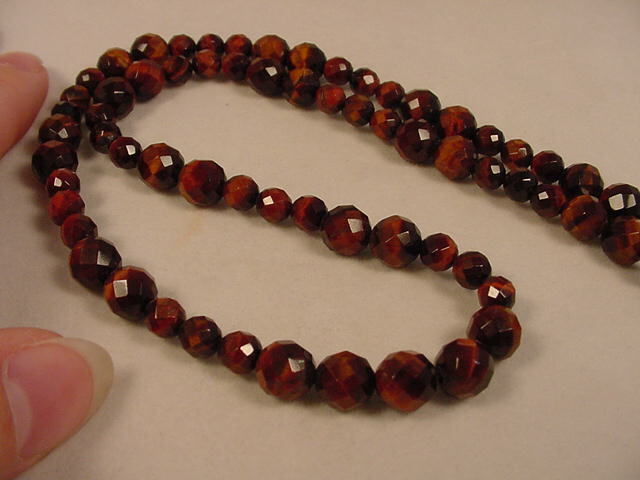 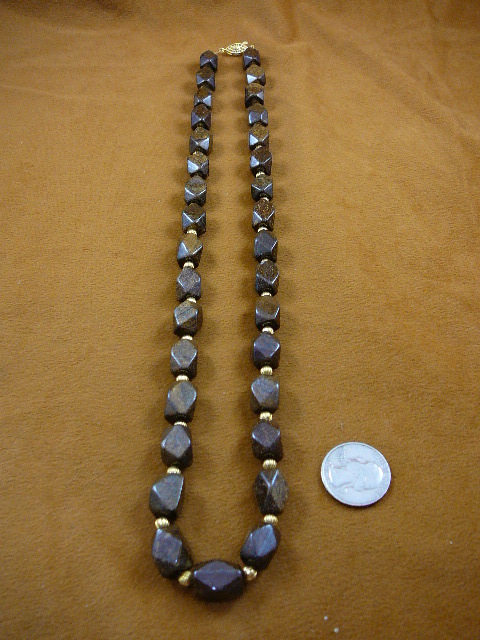 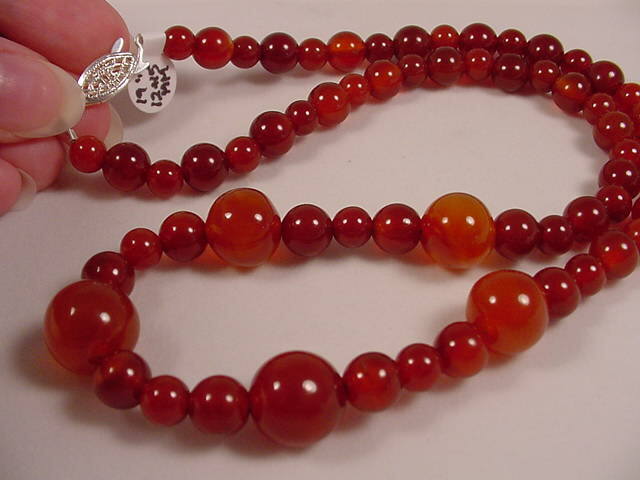 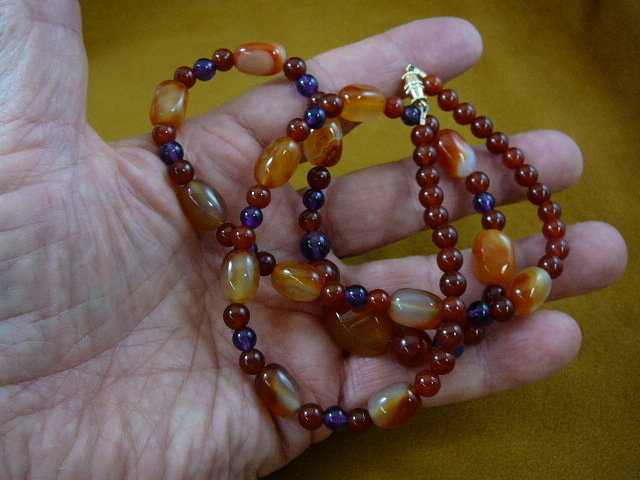 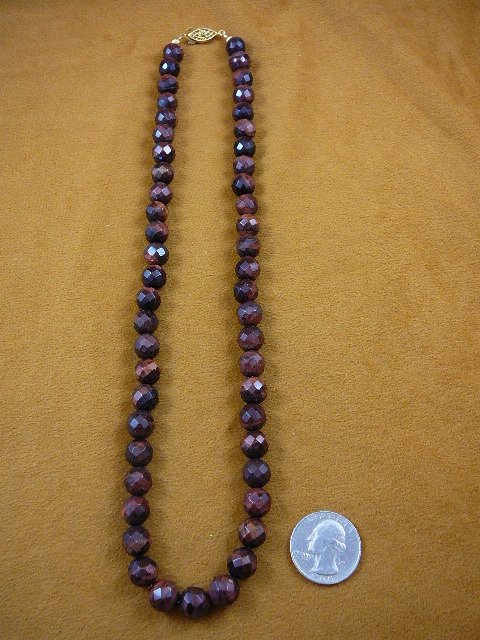 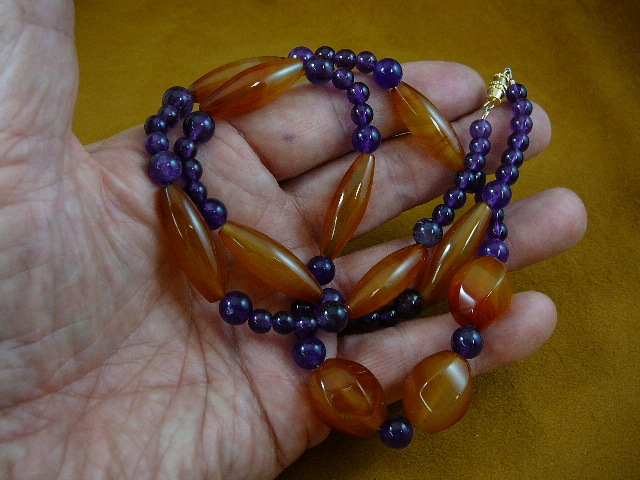 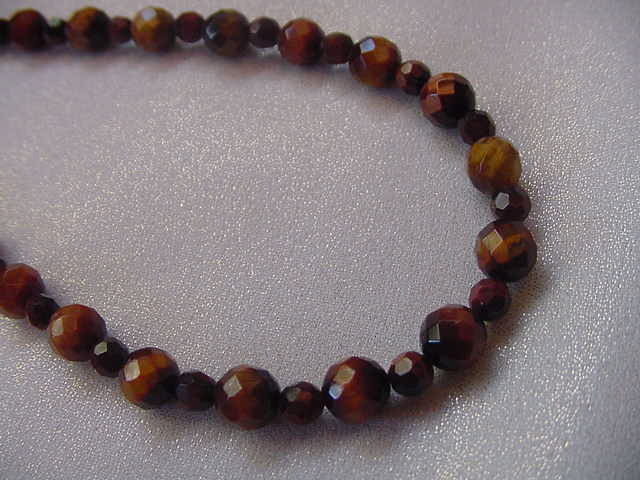 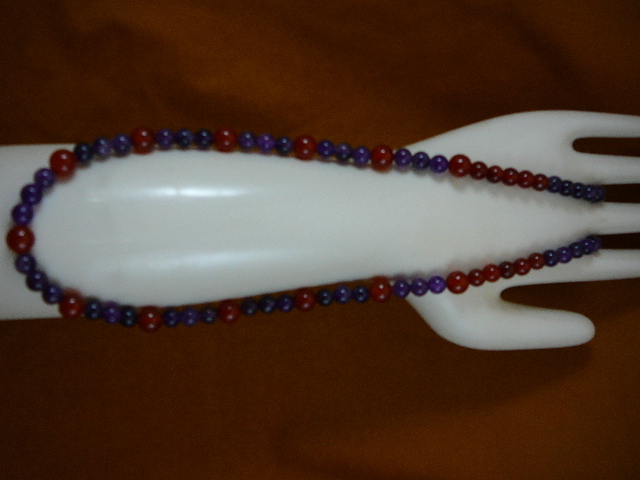 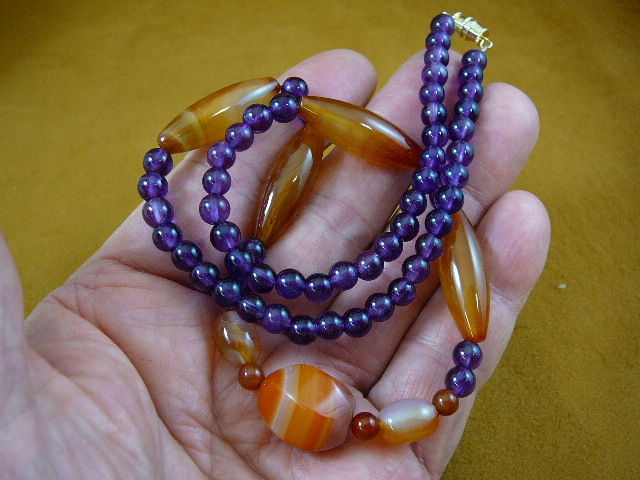 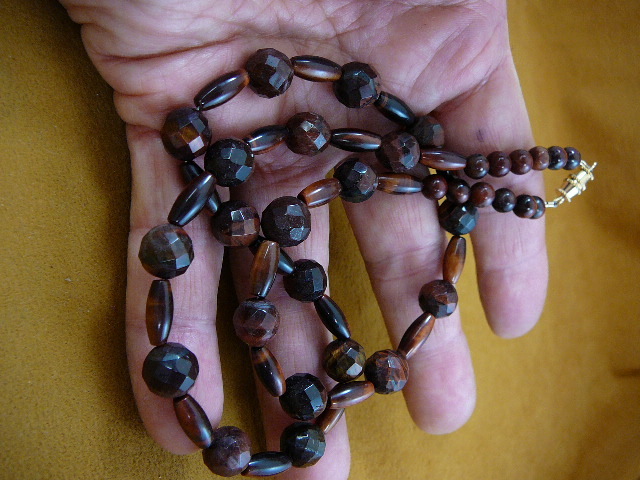 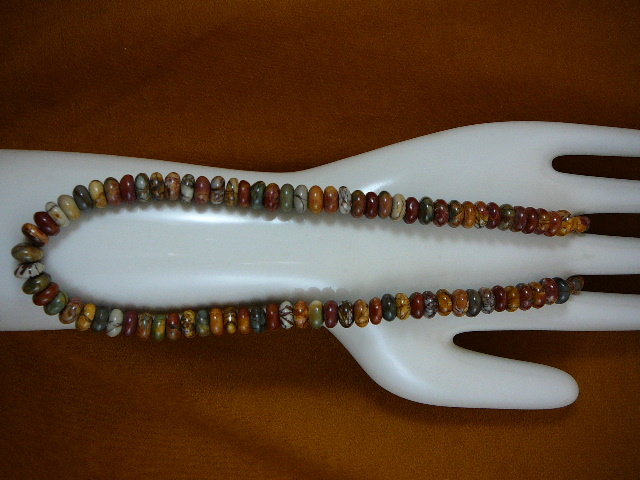 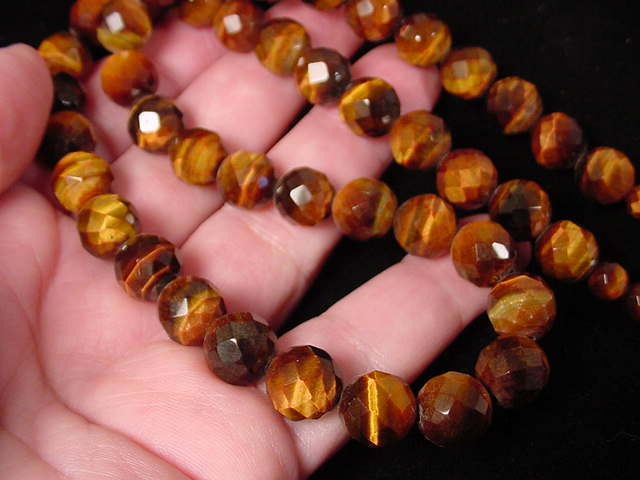 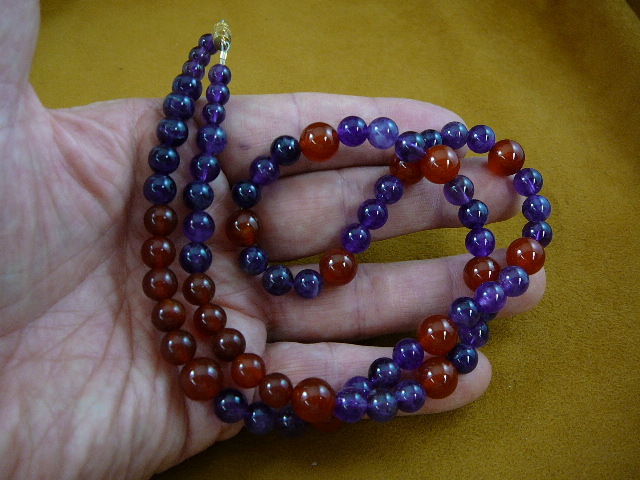 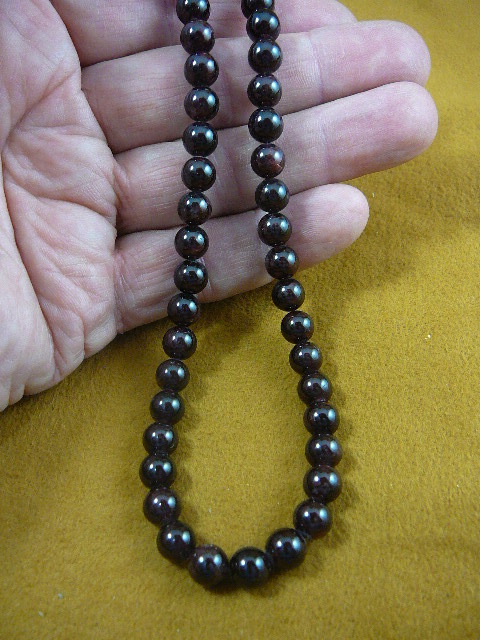 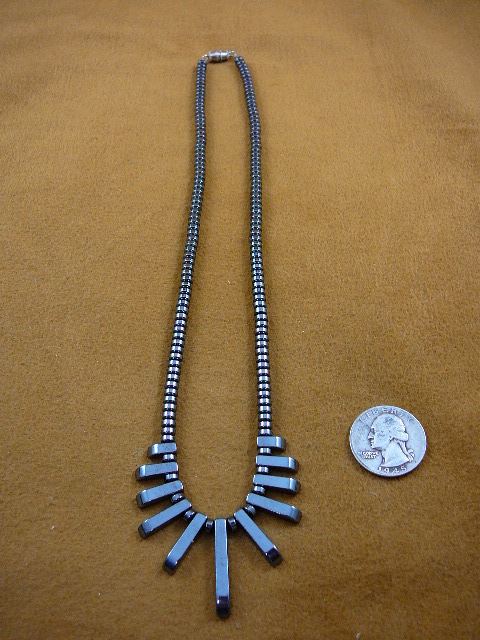 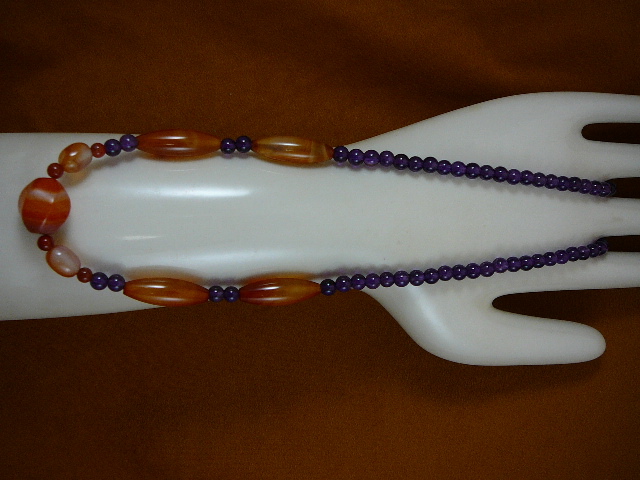 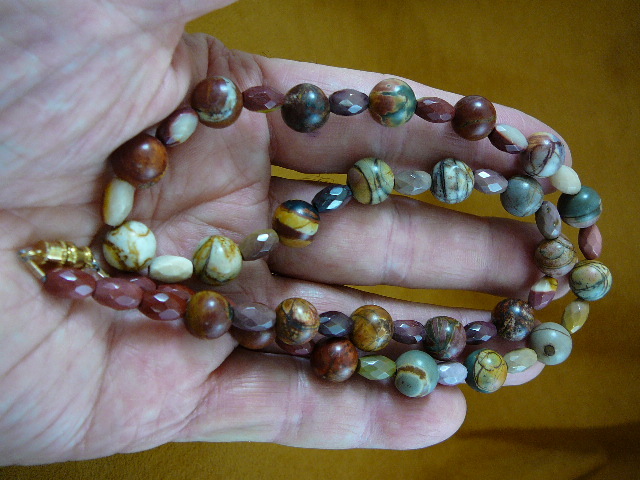 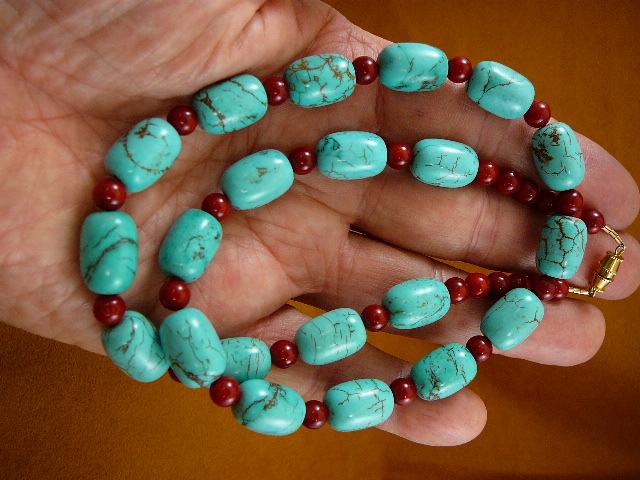 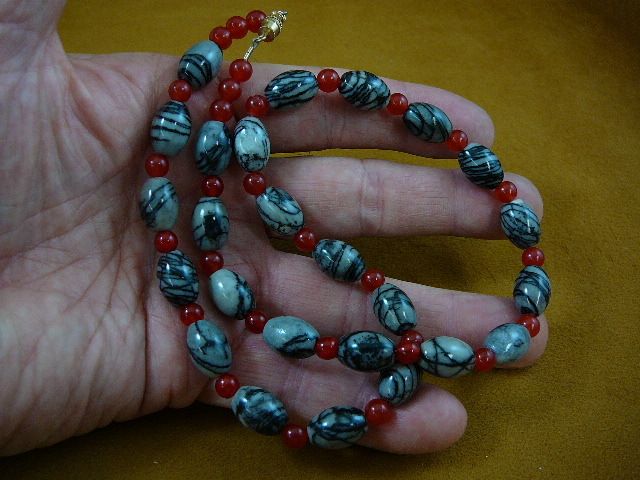 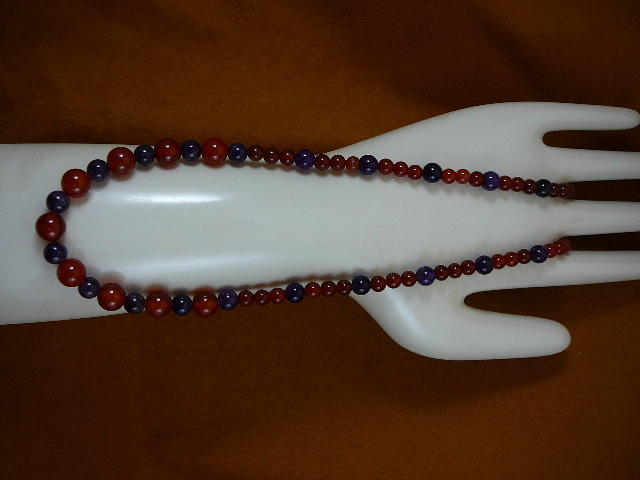 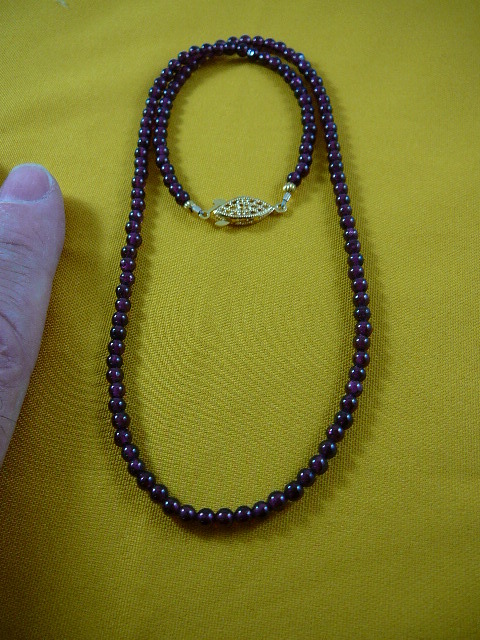 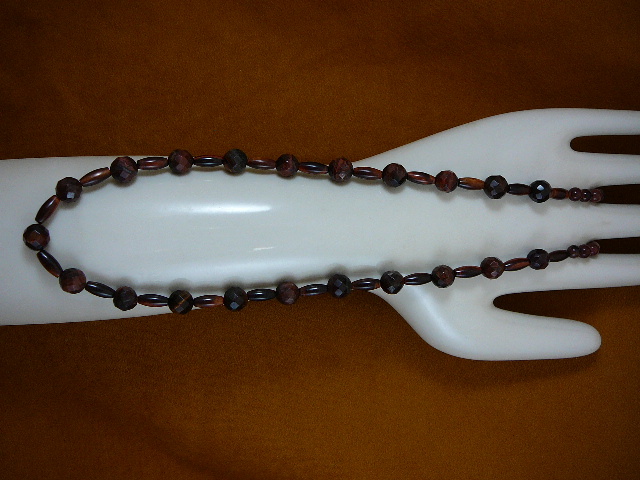 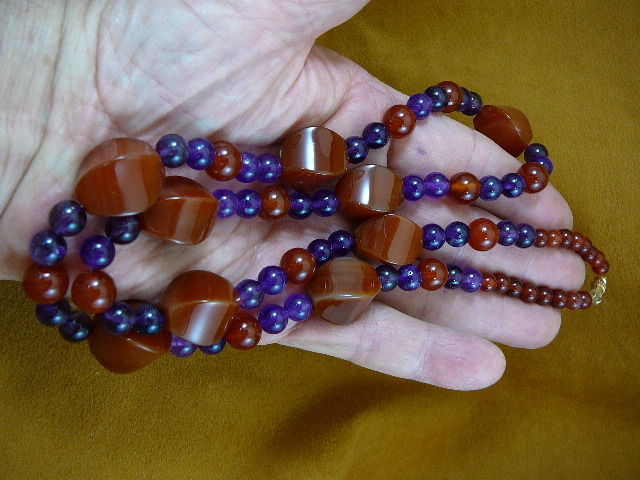 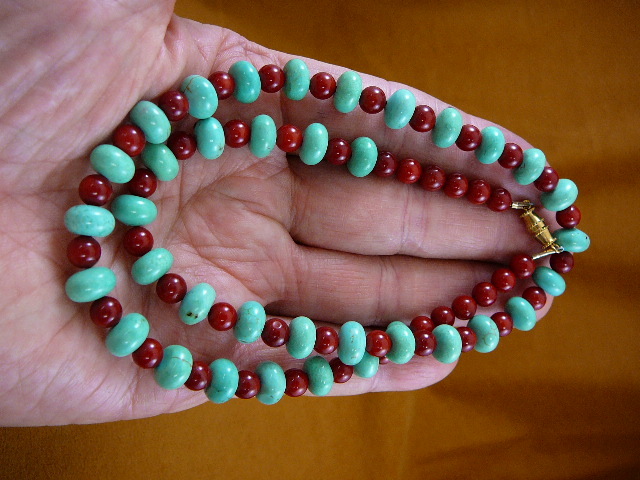 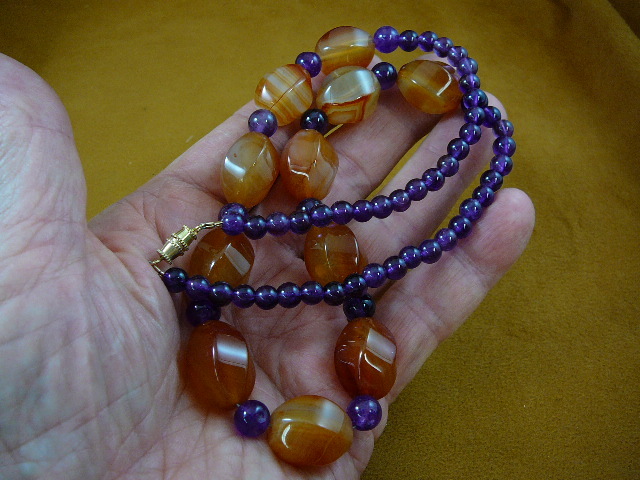 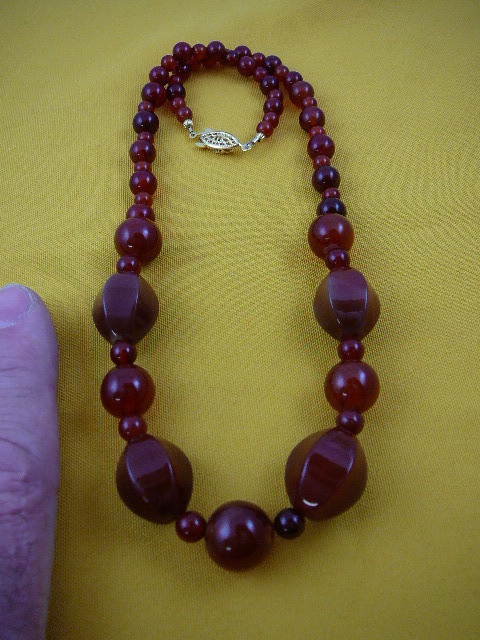 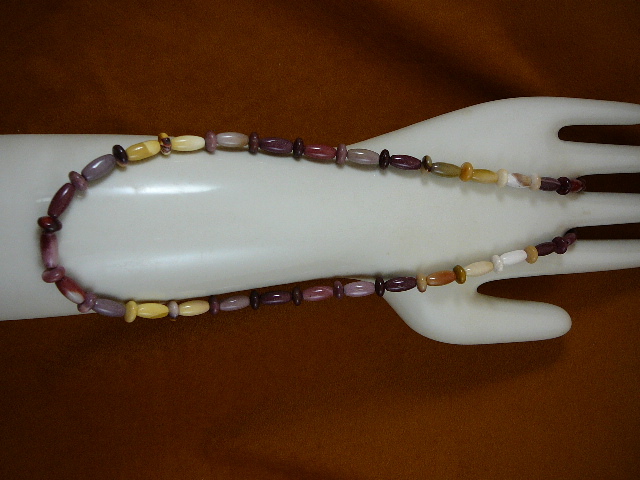 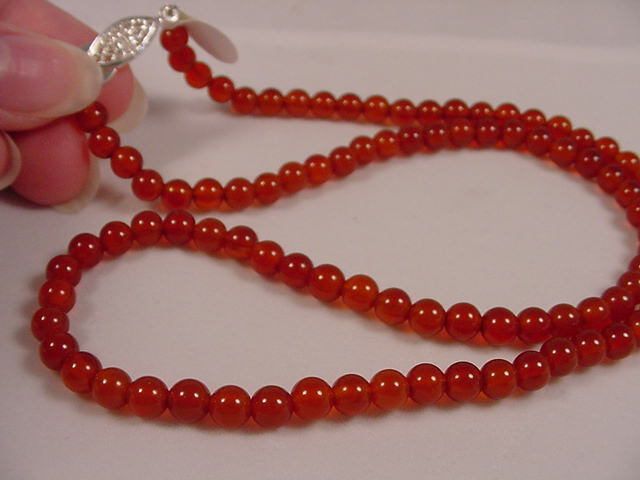 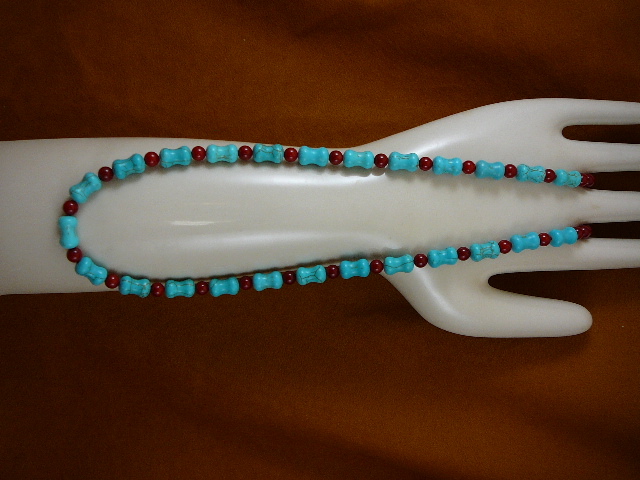 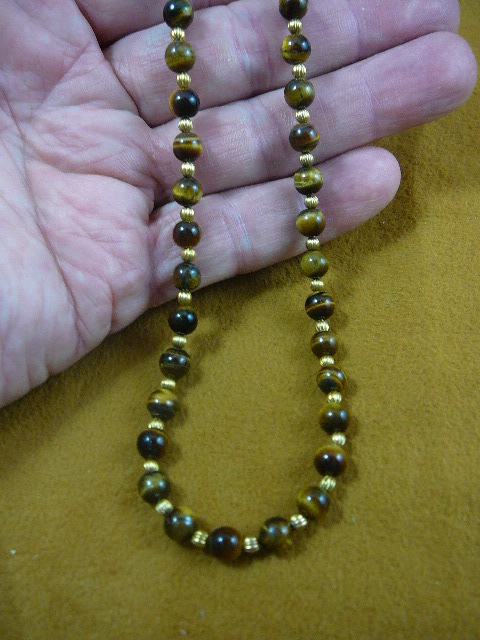 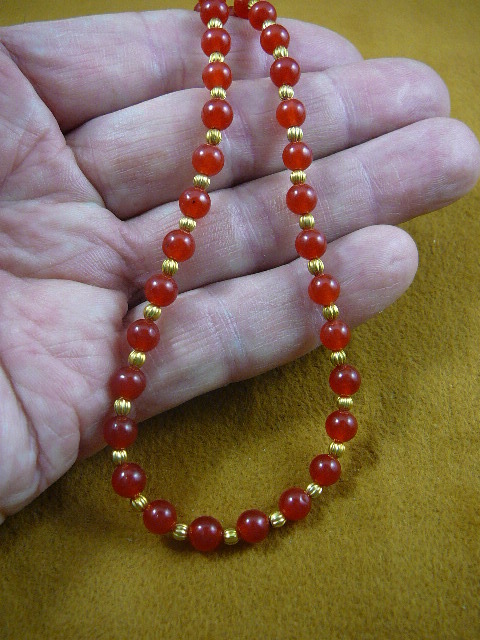 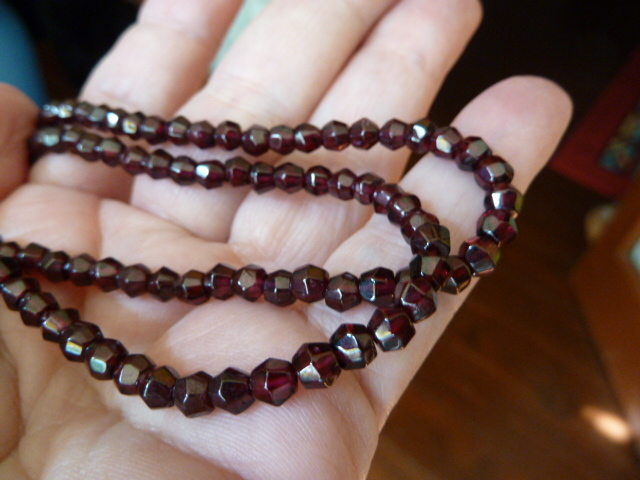 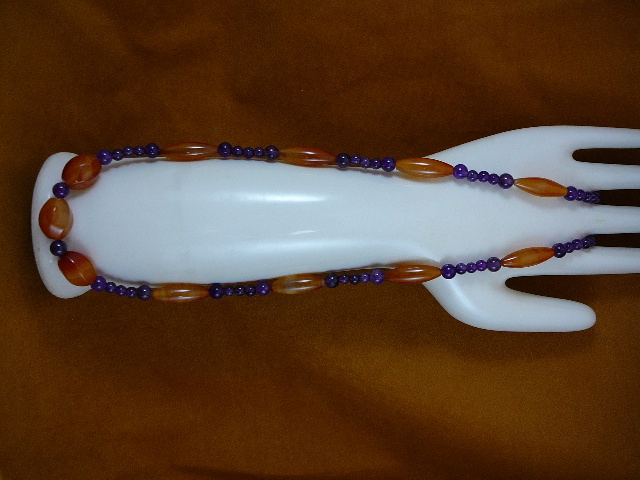 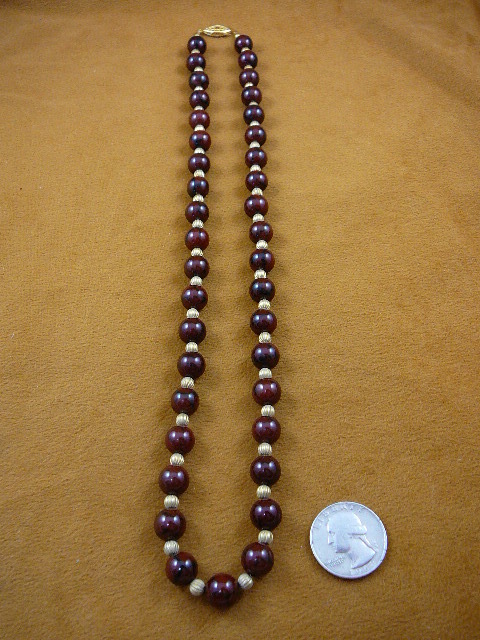 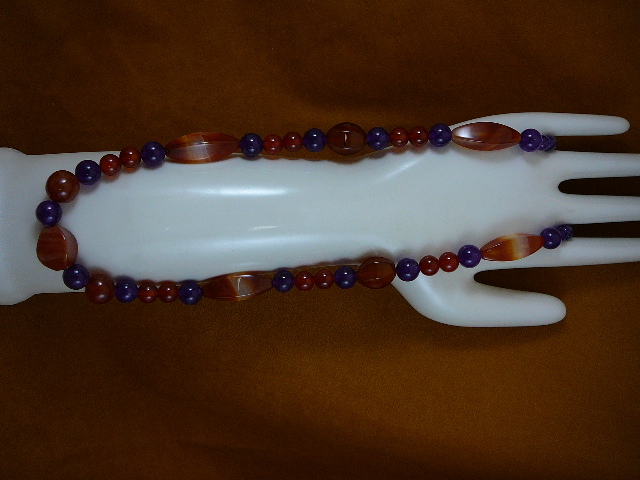 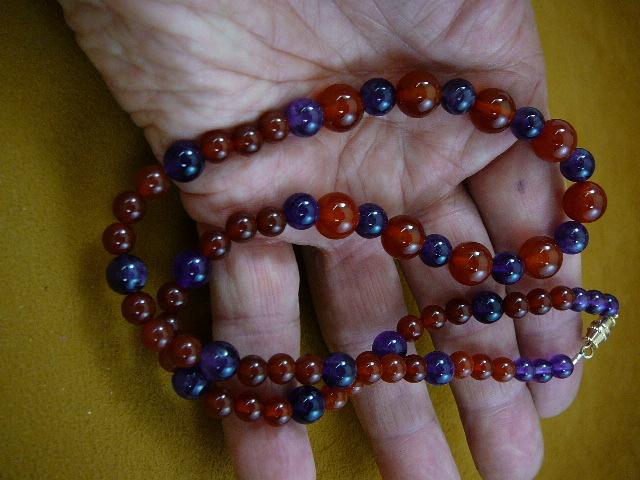 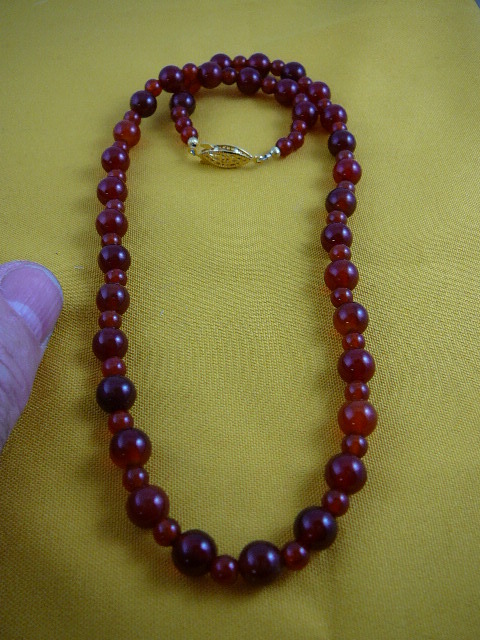 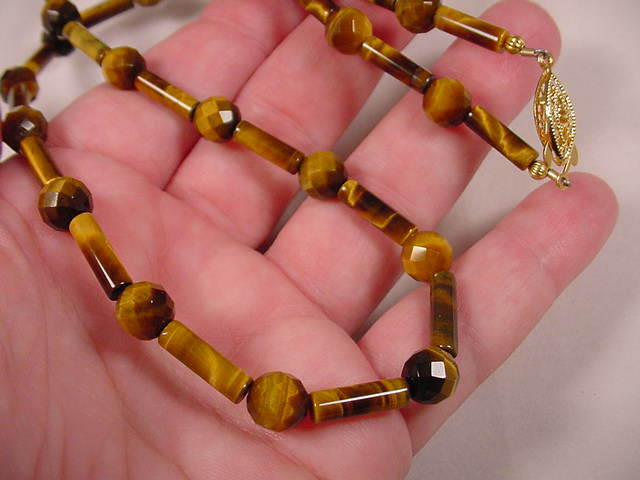 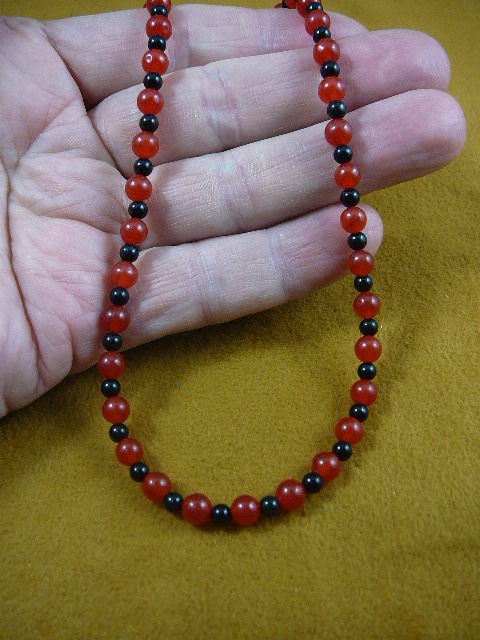 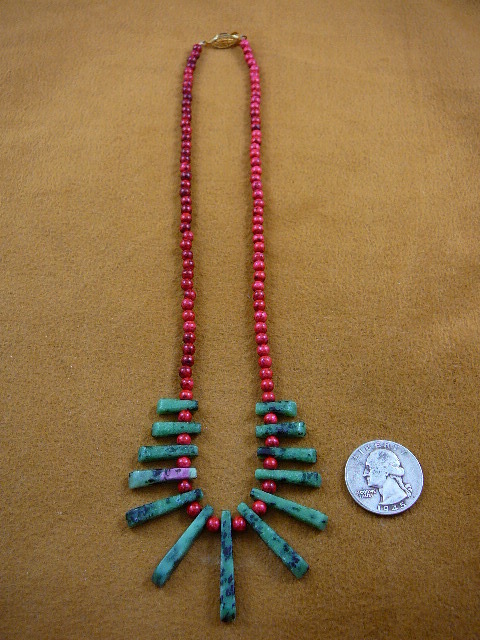 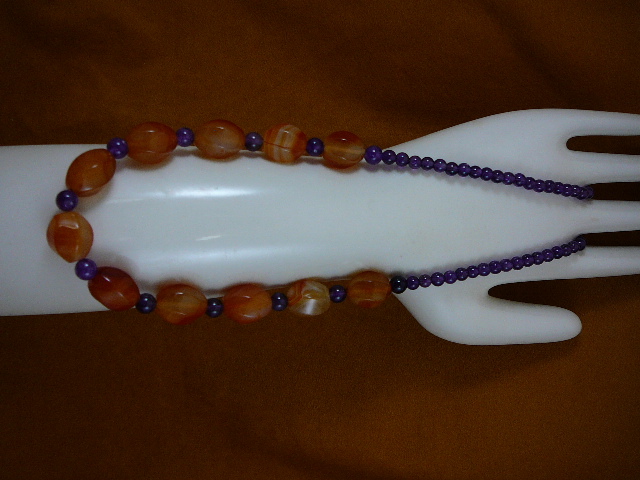 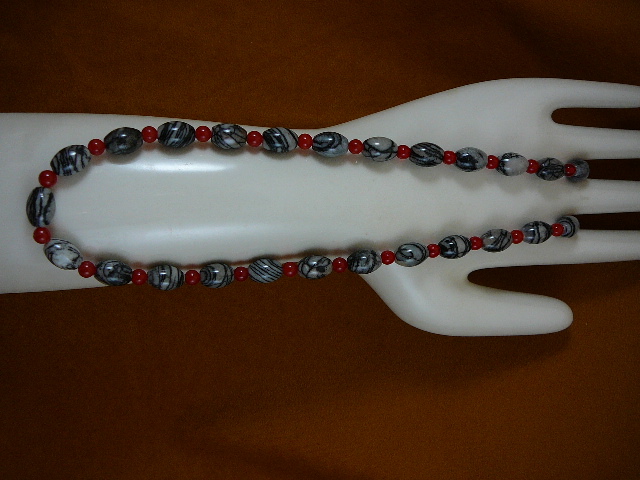 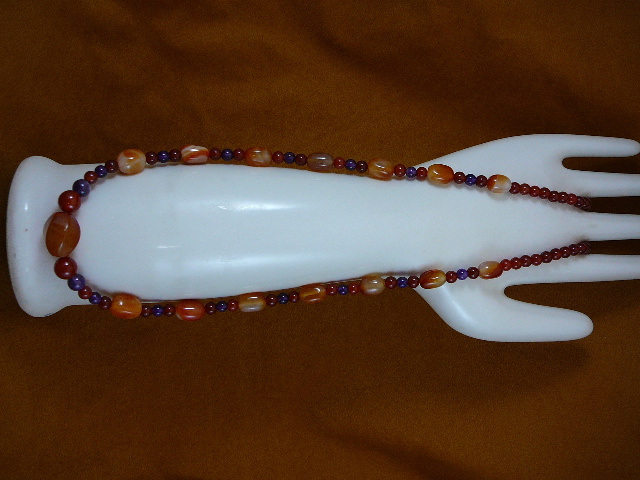 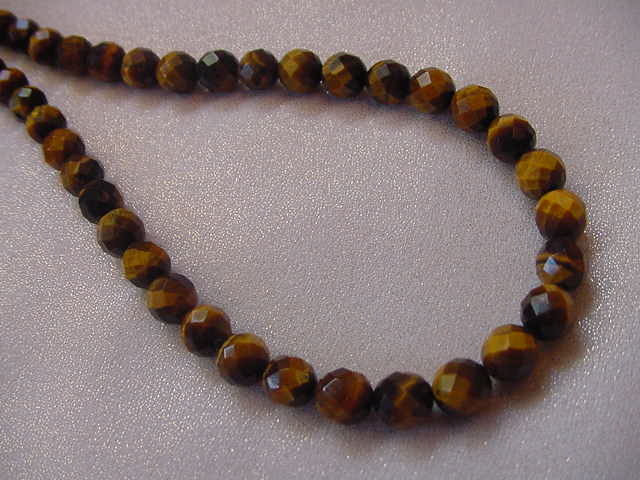 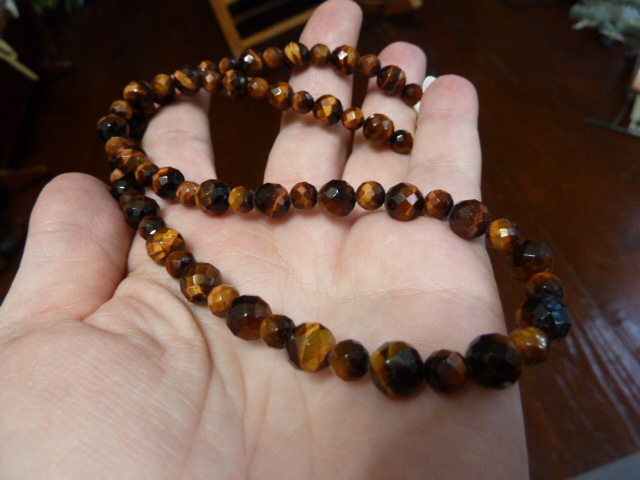 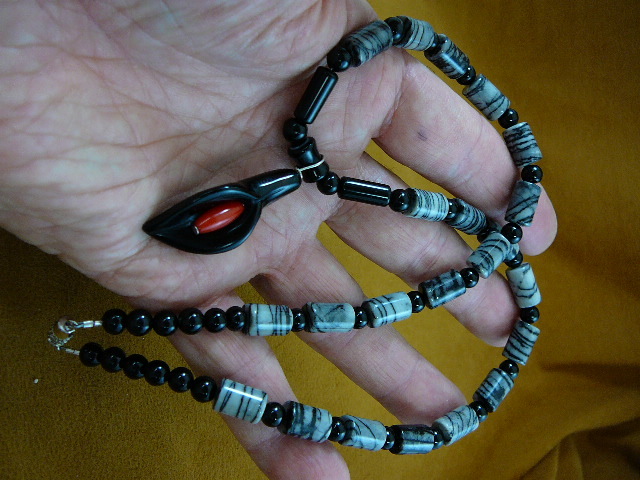 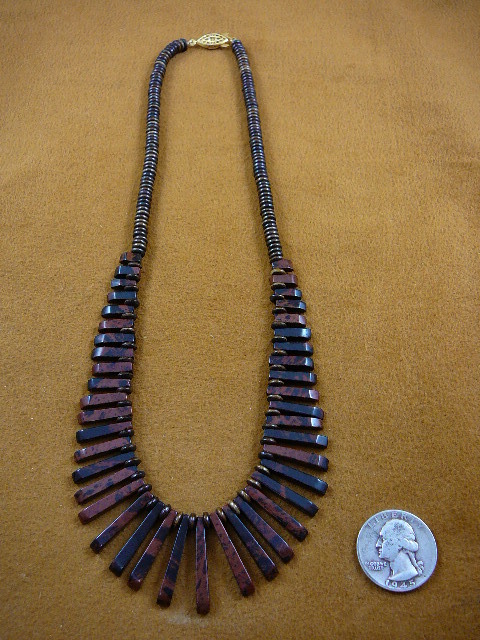 Faceted Carnelian necklace (Brazil), 6 & 8 mm beads, 20" long. 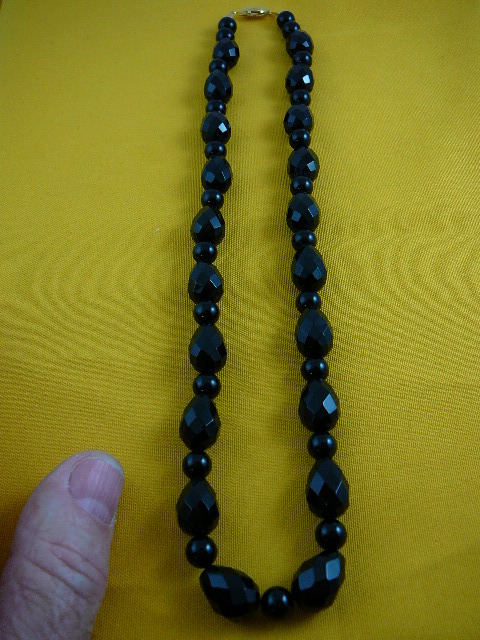 * Larger than 20", special order is $1.00 per inch. 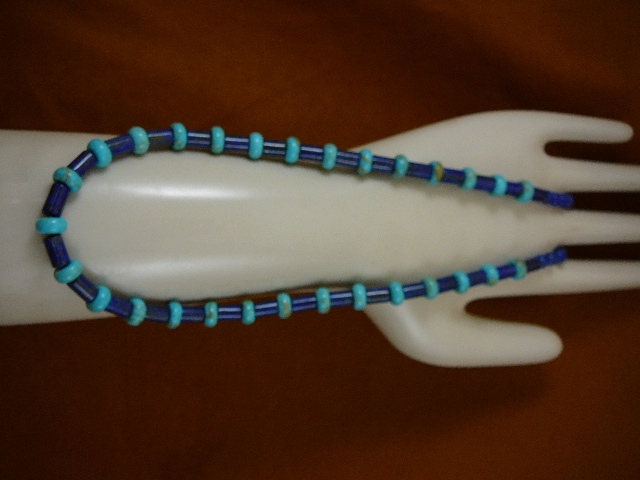 * Larger than 20", special order is $2.00 per inch. 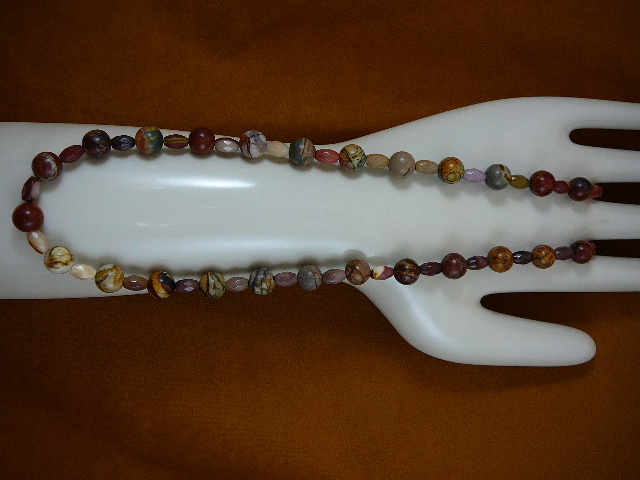 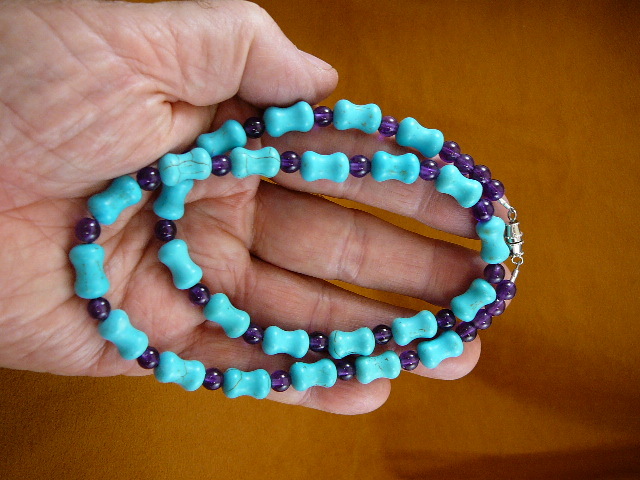 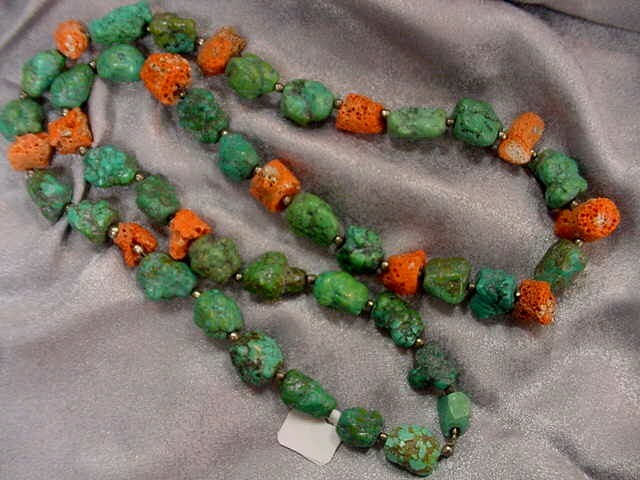 Great one of a kind gift for the Dino lover in your life or yourself! 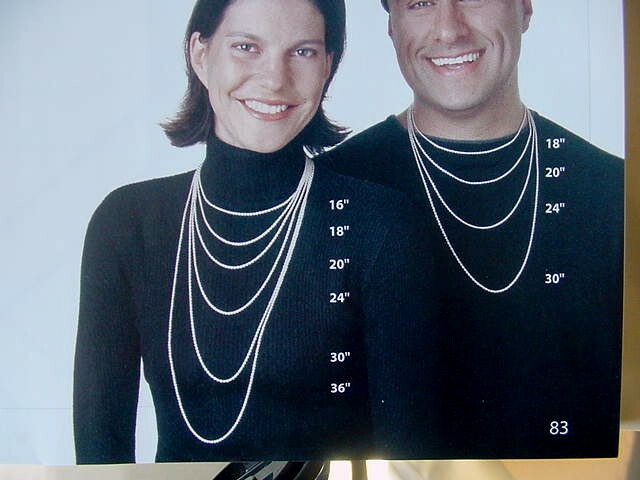 If you're not sure what length to get, analyze this picture to get an idea.